What kind of blog would this be if I only talked about the food that I made and ate at home? I’m fortunate enough to eat out at least once a week, be it for a work lunch or a nice evening meal with friends. I’ll be keeping you up-to-date with all of my experiences from service to quality of produce, price and ambiance. There’s nothing I hate more than spending a lot of money on something that I could have cooked in the comfort of my own home!! Feel free to write in and give your account of a restaurant that you’ve visited recently to whatiatelastnight@hotmail.com and I’ll pop it up on the blog for all to see. Cow and Pig is a new addition to the Bromley dining scene. Offering breakfast, lunch, dinner and cocktails in a ranch-style setting, they work with local suppliers to provide a twist on British classics. We were welcomed by a very friendly and warm assistant manager, and taken great care of all evening by a waitress who helped talk us through the menu and informed us of all of the great local suppliers that Cow & Pig have built a relationship with. Don’t be fooled by the name – although clearly a meat eater’s heaven, Cow & Pig also have a great selection of fish and vegetarian dishes to choose from. To start, I had the English Charcuterie board made up of a selection of delicious cured meats from Cannon & Cannon – a local supplier of artisan meats from England, Wales and Scotland. The meats had a good spicy kick that was offset nicely against sharp pickles and sweet delicious homemade chutney from the owners Mother-in-law! For main, I chose the crowd pleasing ‘Lobster Shepherds pie’ – a creamy, utterly indulgent dish that contained parsnip, carrots, onions, and was packed full of lobster supplied by B&J Fishmongers just up the road. For dessert, we shared the ‘Lemon drizzle Eaton mess’ – creamy, sharp and not to be eaten alone! There is a well stocked bar with an impressive wine list and cocktail menu. To start, I had the rhubarb and custard cocktail which packed a punch with gin, advocaat liqueur, rhubarb syrup and a fine dusting of nutmeg. To accompany the meal, we selected a bottle of English, Chapel Down Wickham Estate red – a spicy, rich red number that went well with my starter and the ‘C&P plate of meat’ that my partner ordered. A great local restaurant serving good quality locally sourced food. The Bull’s Head has recently undergone a major refurbishment. Their once dark red wood boothed restaurant to the rear of the building has been turned in to a beautiful, light open space complete with orangery serving afternoon teas and Sunday roasts. The main bar area has also been given a make over with miss matched shabby chic chairs and walls donning black and white postcards. It all adds up to a lovely relaxing cosy yet large space that’s extremely family and child friendly. We visited with two toddlers in tow (what were we thinking?!) and was greeted by a very friendly waitress who had kindly set out two high chairs in preparation for us. Our waiter was very helpful and accommodating when we asked to move our food outside to the garden to enjoy the sunshine and let the children play halfway through our tea. Afternoon tea is served daily from 2-5pm and there are a choice of three; ‘traditional’ (with loose leaf teas or coffee), ‘decadent’ (with Champagne) and ‘unusual’ – which we chose as it’s served with a Hendrick’s Gin Floridita Tea Cup cocktail (it helped with the toddlers!). The afternoon tea comprised a bottom tier of fresh thick cut artisan bread finger sandwiches – ours comprised salmon and cream cheese, coronation chicken, ham and mustard, cheese and pickle and egg mayonnaise. The second teir was packed with miniature eclairs (one chocolate and once coffee), an almond syrup sponge with icing, delicate pastry cups filled with creme anglaise and mixed berries, tiny macaroons, lemon ovals and squares of blackcurrant sponge jellies. The top tier held a generous pot of clotted cream and mini jars of cherry and strawberry jam to accompany the plate of warm raisin and plain homemade scones. We started with a freshly squeezed orange juice and the Hendrick’s Gin Floridita Tea Cup cocktail that came with our afternoon tea was served from a large teapot filled with ice and a side of fresh raspberries and slices of cucumber. The well stocked bar in the pub also serves craft beers and has an extensive and good wine list plus any spirit you could desire. The perfect place for ‘Mum’s who lunch’ to kick back and enjoy tea, cake and a cheeky cocktail. Situated on the third floor amongst many other places to grab a bite for a break from shopping is Olive OIl & Oregano. When asked to review, the name suggested to me that it would be a shop selling oils, herbs and vinegars and I couldn’t have been more wrong – the open kitchens, grills and fresh modern eating area are busy with diners enjoying authentic Greek food (and they do also sell their organo flavoured olive oil and sauces!). Food is ordered at the counter, where you can see the display of foods on offer. We were then asked to take a seat and food was delivered to our table when ready. There was a waitress on hand cleaning tables and checking that everyone had everything they needed. 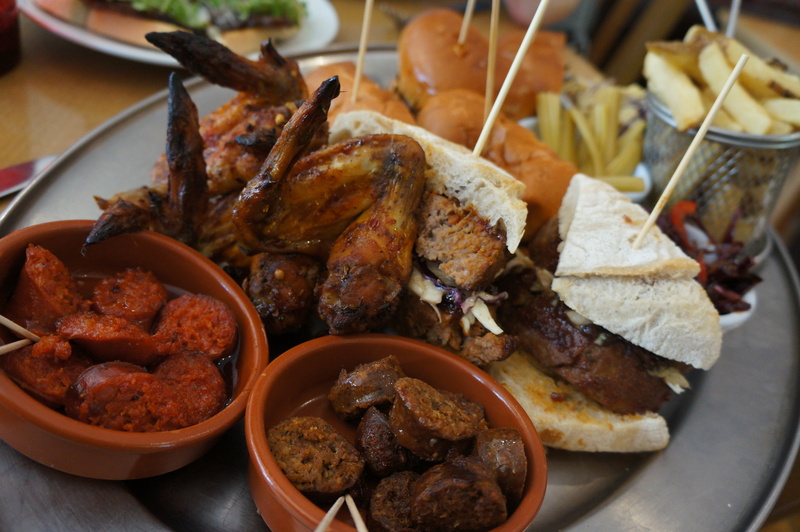 Row upon row of meats being freshly cooked on the wooden charcoal grill, giant chicken burgers, moussaka and vibrant Greek salads are on display at the counter. I couldn’t resist trying the lamb shank – marinated in mustard and rosemary and cooked slowly so that it fell apart. I chose moreish lemony oven baked potatoes and a side of Greek salad packed with mixed olives and topped with a chunk of creamy feta to accompany it. We also enjoyed a taster of the extremely popular pork and chicken Gryos served with a homemade pita, fries, tomato and onions – tender and full of flavour, but unfortunately a little on the salty side for me. A selection of soft drinks are available. I went for a Fanta lemon – something that I only ever seem to order on holiday, so it seemed fitting to drink it with the flavours of Greece. A taste of autherntic Greek food to be enjoyed while shopping for your holidays! The Railway Tavern opened its kitchen in January of this year to a new, shabby chic décor with regular quiz nights and a monthly vinyl record fair. We visited Sunday lunch time when families and couples were enjoying roast dinners, Bloody Marys and a read of the Sunday papers. Food and drinks are ordered at the bar. The staff had clearly all tried the menu for themselves and had some firm favourites when it came to the desserts. All were extremely friendly and we didn’t have to wait long for our food to arrive. To start, we chose the leek and clam chowder – a rich, creamy, umptious chowder that contained small but plump fresh clams. 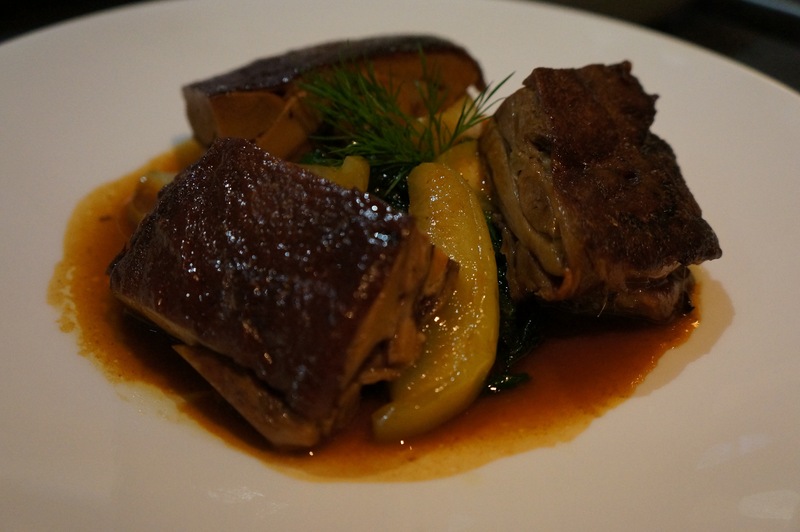 For main, our favourite was the roast pork – a large hunk of slow roast Kentish pork belly that melted in the mouth, save the ultra crispy, perfectly cooked crackling. 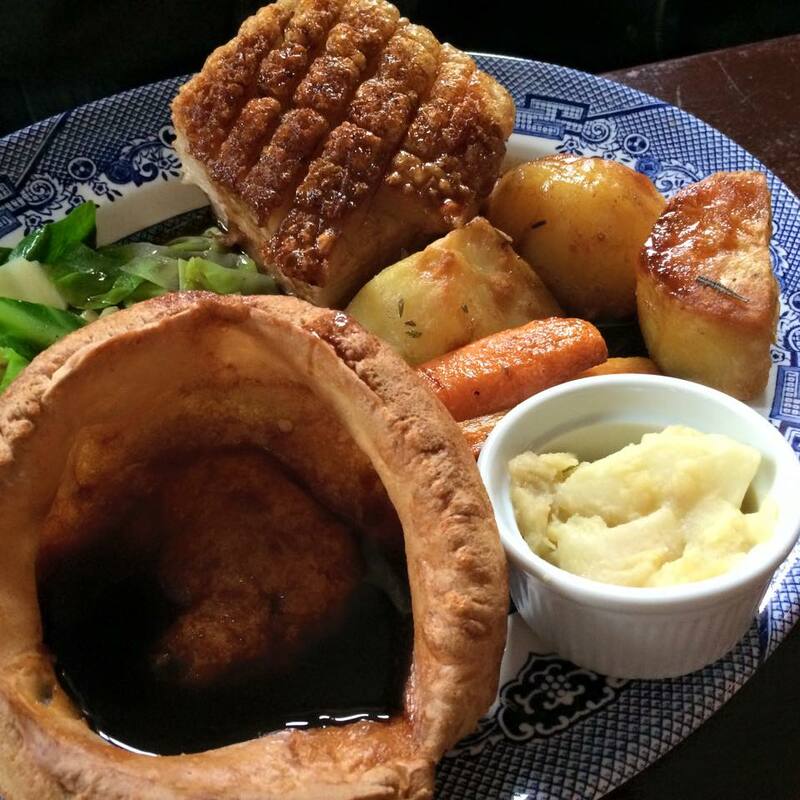 All roasts are served with roast potatoes, Yorkshire pudding (yep, you don’t have to order the beef to enjoy one here! ), carrots, Hispi cabbage and a rich, smooth gravy. Portion sizes are generous, so we chose to share a dessert of sticky toffee pudding with toffee sauce and vanilla ice cream (unfortunately they’d sold out of the Popcorn ice cream!). The toffee sauce was rich and delicious, and a nice touch of edible glitter and small honeycomb stars finished off the dish. A well stocked bar with cocktails, real ales, ciders and decent wines available by the glass or the bottle. We opted for a nice fruity red Montepulciano – not too heavy, easy drinking, and a good accompaniment to our meal. The Chancery opened its doors at the end of last year, becoming the first Independent, family owned Gastropub in Beckenham. Its scrubbed wood tables, wooden floors and warm welcome reflect its sister pub, The Jolly Woodman located just across the road but on a larger scale. There are two bar areas, the first is through the door to your right, which leads out to a vast courtyard style garden with pretty hanging lights, and the second flows through to the restaurant area. We were served at our table by a few different waiters and waitresses throughout the evening – all were friendly, helpful and very efficient. We were taken through the specials board and informed of some of the more popular, favourite dishes on the menu. The menu at The Chancery is seasonal, using locally sourced, organic ingredients where possible. We were hard pushed to make a decision as there were so many great sounding dishes available. To start, we chose the Ham hock and cheddar Fritters – they packed a flavour punch of tarragon with a rich creamy cheesy, melt in the mouth ham hock filling and a crispy breaded outside, served with English mustard mayonnaise and a sweet caramelised onion marmalade that cut through the richness of the fritters. 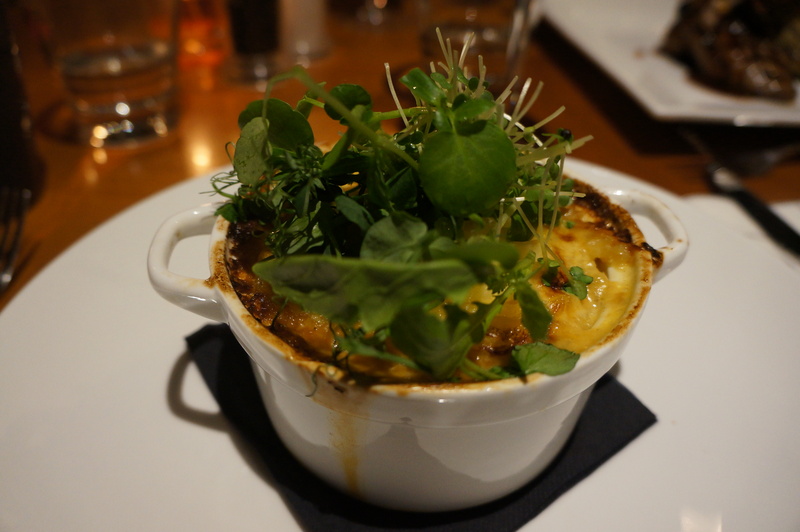 For main, our favourite was the smoked haddock and salmon fish pie – big chunks of fish served in a delicious white sauce, topped with a cheesy mash and served with a side of mixed green vegetables. For dessert, the lemon posset topped with an oaty crumble just about finished us off leaving no room for anything else. We started with a gin and tonic, and were taken in by the menu of handpicked wines on offer. We chose a bottle of Callia Malbec from the town of San Juan. It was fruity and lighter than some Malbecs which made for easy drinking. A gastronomic feast of a pub. The opulent curtains, dark blue velvet seating and pretty fairylights feel almost theatrical when entering Okiko but the traditional paper lanterns hanging above a bar well stocked with Japanese Sake and a large gilded mirror covering the face of the Chef, but revealing his hands at work with the freshest of raw fish gives way to the fact that you are infact in a Sushi restaurant, something that Bromley hasn’t had – until now. We were served by Emi – helpful, knowledgeable, extremely welcoming and even though English, fluent in Japanese. We were told how Okiko is a family owned business and shown some of the delights of Japanese culture, food and drink. We couldn’t have asked for better service. Emi took us through the menu, recommending two or three light bites to share to get a taster for the different dishes on offer, and then we moved on to the main course. To start, we opted for the octopus and scallop sashimi. The scallops were ultra fresh, sweet and like silk on the tongue. The octopus had a moreish texture and was full of flavour. We also shared chicken and vegetable dumplings which although deep fried were still light enough for a starter, edamame flavoured with hot fish sauce, and a softshell crab hand roll – crispy tasty crab with sticky sushi rice encased in a sheet of seaweed and topped off with tiny balls of caviar that popped and crunched in the mouth. 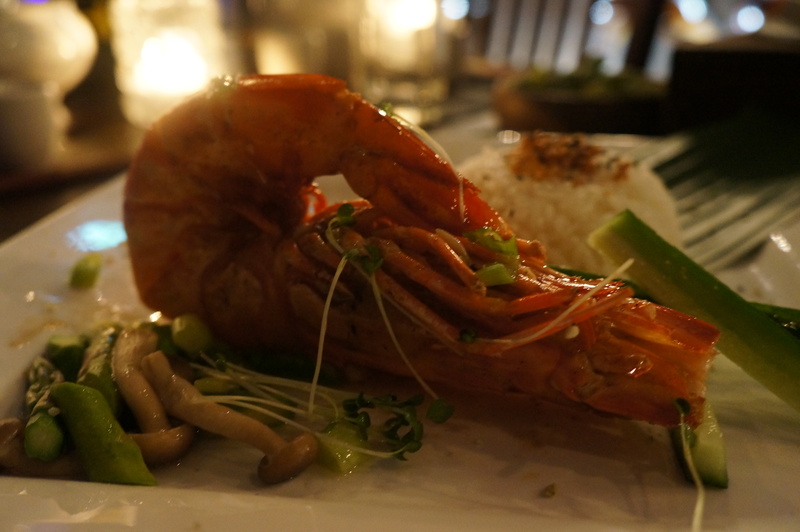 For main, our favourite was the super sized king prawn simply cooked on the grill and served with sticky rice, asparagus and mushrooms topped with an Okiko sauce of soy, fish sauce and teriyaki. We started with a nice fruity dry white wine and Kirin beer, and then moved on to more traditional Japanese drinks that we were pleasantly surprised with. 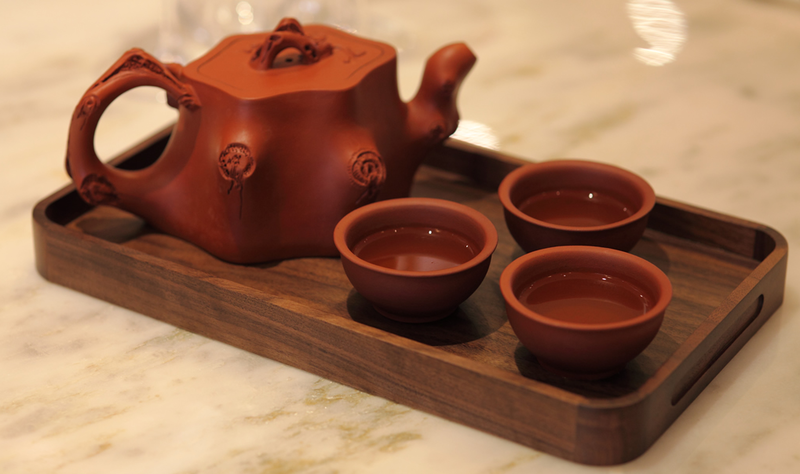 Sake is served hot at Okiko, and there is a choice of a sweet or dry version. We were fortunate enough to try both and favoured the dry – although both were extremely good. After the meal we were presented with a plum liqueur, served on ice. It was a lovely palette cleanser and tasted slightly like Amaretto in taste – we’ll definitely be back for more! Fresh, friendly Sushi in an opulent setting. The British queen is a new addition to Locksbottom. 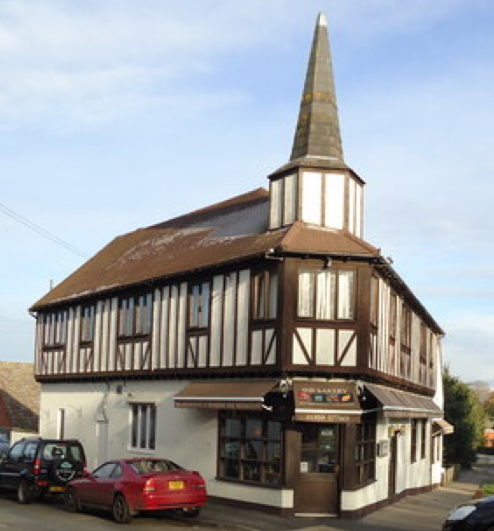 Owned by The White Brasserie company, it offers a warm homely traditional country pub feel to the front, and a large but homely restaurant to the rear with open kitchens, rugs and comfortable seating. We visited on a Sunday when tables were full to bursting of families enjoying Sunday lunch. The service was effortless and welcoming. We were served by three different members of staff and the consistency and communication between them was great. We were even offered the phone to use as we couldn’t get a reception on our mobiles! There are dishes to suit all kinds of palettes with two different menu options for children – a real bonus for a local restaurant. 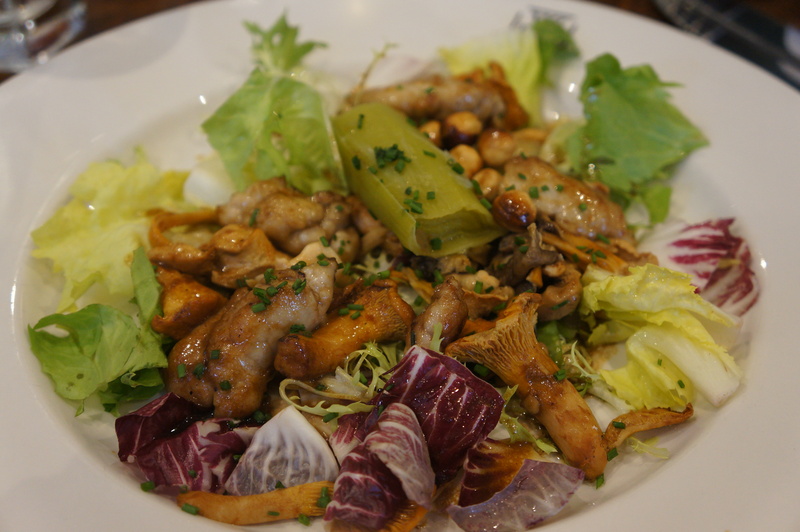 To start, I chose the pan-fried lamb sweetbreads, served with pickled wild mushrooms, roasted hazelnuts and mixed leaves. The sweetbreads were plump and rich and went amazingly well with the rest of the dish with flavours popping at every mouthful. For main, I opted for the roast Scottish scallops served with smoked bacon, autumn vegetables and meuniere sauce – another delicious dish that was well balanced with the smoked bacon offering perfect seasoning. For dessert, I went all out for the chocolate souffle with bitter chocolate ice cream. The chocolate oozed from the middle of the souffle and the bitterness of the ice cream cut through the richness of the dessert – another perfect dish. We started with a house (Beefeater) gin and tonic served with a good squeeze of lime and plenty of ice. There are a wide selection of wines available to order by the bottle and the glass. I opted for Viogioner which cut through the richness of the sweetbreads and enhanced the sweetness of the scallops. Good food guaranteed in a warm and friendly local. A new Carluccio’s has just opened in intu Bromley shopping centre – a well welcomed breakfast and lunch time option to add to the ever growing foodie places coming to the area. Its open space draws you in with Carluccio’s tempting deli treats in the bar and entrance area and there are a nice mix of large and small tables with a breakfast bar and stools station, perfect to grab a coffee or a sharing platter. I love Carluccio’s not just for the amazing quality of produce, but for the friendly experienced staff that they all seem to attract. We were greeted by a manager who has travelled from Bristol to ensure the first few months of opening run smoothly, and that the staff are bought up to speed. We had a little wait between ordering and our food arriving, but we were kept informed, and my little boy entertained, with one of their kids packs and could clearly see that the whole restaurant was fully booked and has been since it opened. Carluccio’s source the freshest natural products from Italy and the UK, and it shows in the flavour and simple preparation of the dishes. Portion sizes are generous and reasonably priced – it’s just ‘proper’. To start, we shared the Fritto Misto, an antipasto of lightly floured and fried calamari, white bait, king prawns, sardine fillets and vegetables. Served with a good wedge of grilled lemon and a red pepper mayonnaise, it was fresh and delicious and not what you’d expect to find in a shopping centre! 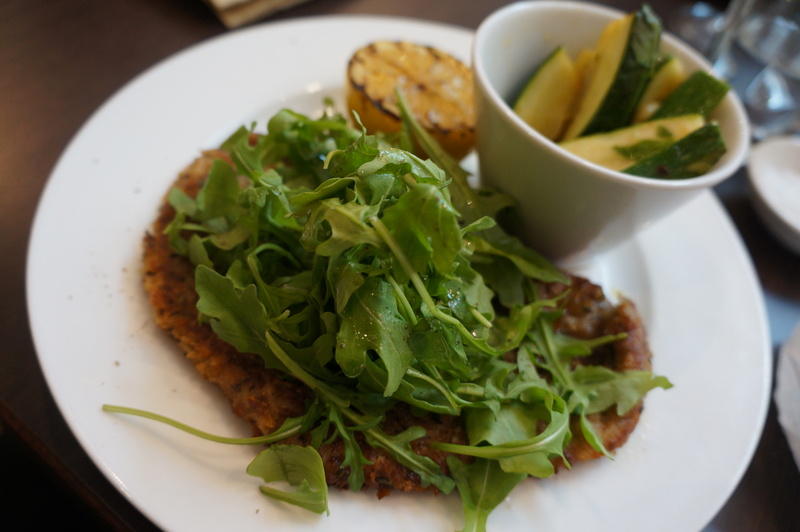 For main, I chose the ‘Cotoletta di vitello’ – a light herby and parmesan breaded rose veal from the UK that melted in the mouth, served with rocket and lemon and a side order of courgettes pan fried in butter. My partner had the Ravioli – hand made perfectly cooked fresh golden pockets of pasta filled with spinach and ricotta and served with plenty of metled butter and sage. We couldn’t fit in dessert, but were definitely tempted to take home one of the amazing colourful extra large meringues that were sitting on the side as we left! There are a good selection of wines available from all over Italy both in the restaurant and to buy and take home. I opted for a fruity glass of Frascati that accompanied the fritto misto well – easy to drink and served perfectly chilled. Wines start from a reasonable £14.95 a bottle and can also be ordered by the glass. A taste of Italian charm admist shopping centre mayhem. 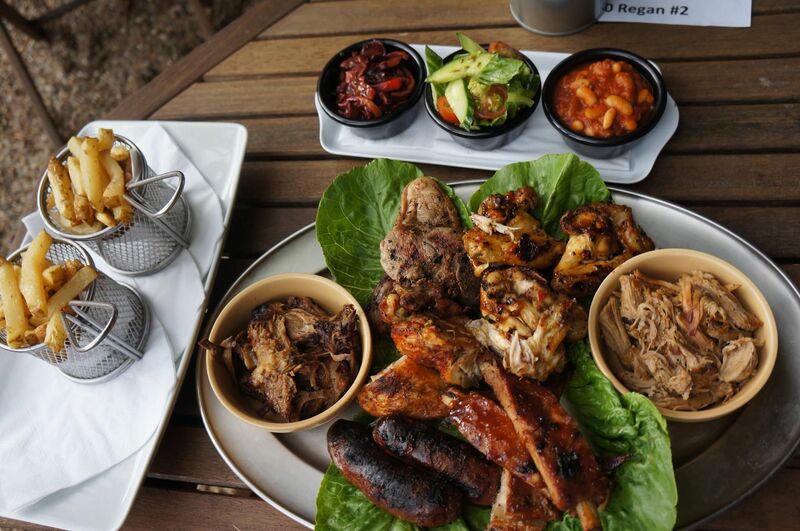 Set in the courtyard of the Bull Hotel in Wrotham is the new smokery and BBQ ‘The Bull Pitt’ – available only at weekends for the summer months (until September) come rain or shine, there’s an extensive carnivores dream menu along with artisan beers and when we visited, an amazing Jazz band. It’s not your usual walk up and queue for food BBQ, instead this is restaurant style table service with friendly staff and a happy Chef at work. Drinks as well as food were delivered to our table meaning that we could sit back and relax in the sunny courtyard. When reading the menu you’d think you were attending a trendy London pop-up restaurant with all the latest amazing must haves for meat lovers in one place – a pint of smokey fruity chilli chicken wings, red slaw with smokey horseradish sauce, 12 hour apple wood smoked Harvel House pulled pork…the list was endless and we were stuck to make a choice – “no problem” the waiter said, “we’ll make you up a platter for two with a bit of everything”…WOW there was a LOT of food! Everything was perfectly cooked and packed with flavour (although the chicken was a little on the bland side, the ribs totally made up for it!) Their BBQ sauce was almost like a sweet curry dip that we ended up smearing on everything – dipping chips, the slaw was coated in it and we found ourselves asking if they had bottles of the stuff to buy and take home (sadly not). To end the meal we couldn’t manage much more than to share a sorbet – but even this was delicious, unique and heady, a blend of lime and tarragon set on top of smoked paprika and mild chilli cured pineapple slices. I’ll be going back to try the artisan cheese board and the strawberry and custard lollipop once my overly full belly subsides! English artisan beers from the likes of Camden town brewery, Beavertown brewery and Redchurch brewery are available – along with (to my husbands delight) a cigar menu! The rose was also English, crisp and perfect for a summers day. In the pretty village of Chipstead stands this sixteenth-century pub. A cosy, friendly local welcoming families and friends to eat and drink in front of its roaring log fire with a menu that changes daily and sources produce from organic and local farms in Kent, Sussex and Surrey. I left inspired to want to go home and cook – trying out new flavour combinations and techniques displayed at the George & Dragon. The manager is on-hand to ensure everything runs smoothly and that all guests are taken care of. He is supported by a friendly, polite and efficient team. This isn’t your usual ‘pub grub’. The quality of produce is exceptional and the menu offers twists on some great classics. To start, our favourite was the Chart Farm wood pigeon breast served perfectly pink on a bed of smoked bacon, lentil and butternut squash – a perfect mix of rich and earthy flavours. For main, the Haunch of Chart farm venison served medium rare melted in the mouth and was served with subtly flavoured blue cheese dauphinoise, curly kale, prune and armagnac puree. Portions were a little on the smaller side, however meant that we had plenty of room for dessert – we couldn’t resist the Whiskey sticky parsnip pudding with Taywell farm vanilla ice cream. Sweet, rich and with a subtle smokeyness from the Whiskey it was the perfect way to end the meal. Wines start at £15.50 a bottle with plenty of choice available by the glass. We opted for Merlot De, Gras – a nice light red from Chile that accompanied the meal perfectly. Fine dining in a cosy friendly local. Located in what used to be a pub next to Sundridge Park train station, Cinnamon Culture has a sophisticated modern feel. Upon entering you are greeted with a long well stocked bar perfect for pre/post dinner cocktails. Tables are dressed for fine dining and the menu stands out as something very different to other Indian restaurants in the area. The manager is there to greet guests and talk through the menu. He is supported by a large team of waiters and bar staff ensuring everything runs as smoothly as possible. Cinnamon Culture offers far more than your usual Indian menu. It is scattered with interesting ingredients such as Buffalo and lobster, and also has a taster menu available. 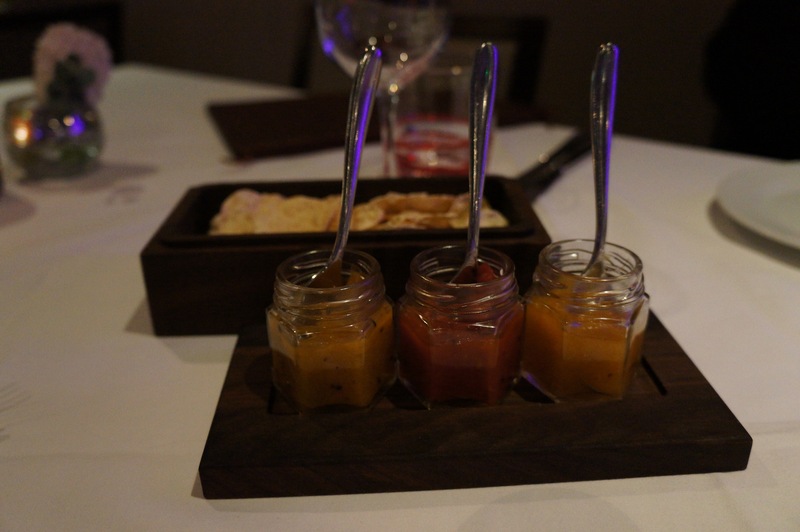 Before the meal we were presented with a trio of chutneys – tamarin and raisin, pineapple and chilli, and mango to enjoy with warm fresh poppadums. To start, our favourite were the scallops cooked and served two ways – Moilee, which consisted of a creamy rich coconut tinged sauce and the other spice crust, pan seared. Both gave bursts of interesting flavours and the scallops were perfectly cooked. For main, the Raan Mughlai stole the show – slow braised lamb shank with spices, finished in the tandoor with a curried butternut squash and sauce reduction. For dessert, a refreshing honey and candied ginger Kulfi ice cream ended the meal with a zing. Forte Sangiovesi, a fresh, dry Italian red that was a good match for some of the spicier dishes. A sophisticated Indian restaurant and bar with a difference. White washed floorboards, walls and chairs with rustic wooden tables and little white lanterns give a feel of stepping into an Italian pizzeria on holiday. Pictures of boats and blue seas from Naples adorn the walls and there’s a great buzzy atmosphere of people chatting, eating and watching the chefs working the pizza oven to the back of the restaurant. The owners, Fabrizio and Massimo ooze Italian style and charm, working the tables to welcome newcomers and greet regulars. They’re supported by a friendly and attentive team. BIANCO43 are intent on sourcing high-quality fresh, authentic Italian produce and this was reflected in the taste and texture of every dish. To start, our favourite was the Insalata di polpo – a refreshing salad of tender juicy fresh pieces of octopus served with cubes of boiled potatoes, celery shavings and olives. The fresh, bitter and sweet combinations worked well to get the palettes going in preparation for the main course. We also shared the Taglieri del contadino – a platter of sweet Parma ham, delicious salami and Martadella with mixed grilled vegetables and crispy bread. For main, we had to try a pizza because they smelt and looked so good and were being freshly made and cooked downstairs in the extremely hot Neapolitan wood fired pizza oven. I opted for the ‘4 stagioni’, a floppy tasty base with a perfectly chewy crust topped with tomato sauce, artichokes, cooked ham, spicy sausage and velvety mozzarella. 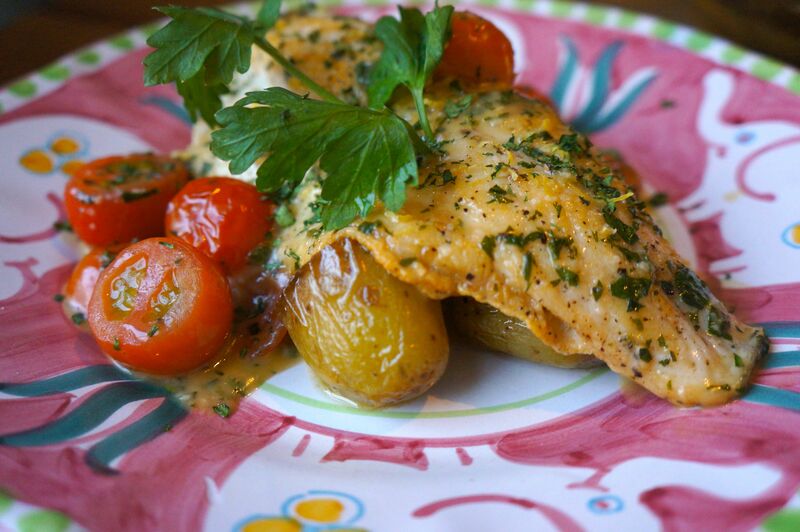 My partner had the seabass fillet – meaty, fresh and absolutely delicious served with roasted new potatoes and tomatoes. 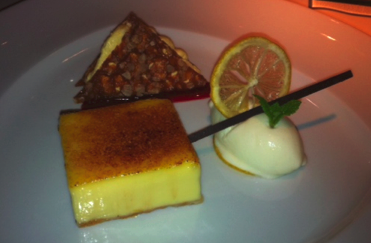 For dessert, we enjoyed Frutinni – a selection of homemade fruit filled sorbets or passion fruit, lime and walnut. We were told that these are an Italian delicacy and that they’re sent over each week to the restaurant. A perfect way to end the meal with sweet, refreshing flavours. There are a good selection of wines on offer – we chose a glass of the Valpolicella with good body and a taste to accompany the starter of cured meats. To finish the meal, a glass of ice cold Limoncello hit the spot aiding digestion, cleansing the palette and seeing us on our merry way. 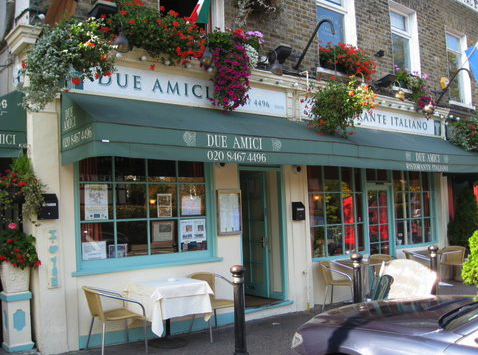 An authentic Italian restaurant in the heart of Greenwich that you MUST try! Situated in a very pretty village and Grade two-listed building, the Poet offers the warmth of a country pub upon entering, and the cosyness of a local restaurant with miss-match wooden chairs and cushioned window seats. A framed picture of Heston Blumenthal and the Chefs from the Poet takes pride of place on the mantel giving an indication to the quality of the food. Both the manager and the waitress who served us were extremely friendly and helpful. Their passion for locally sourced produce, being a part of the community and ensuring high standards really rang through. There is a well put together menu that changes around four times a year and with a daily specials board. We began with some warm perfectly baked homemade rolls – one sultana and walnut, the other rosemary and poppy seed. 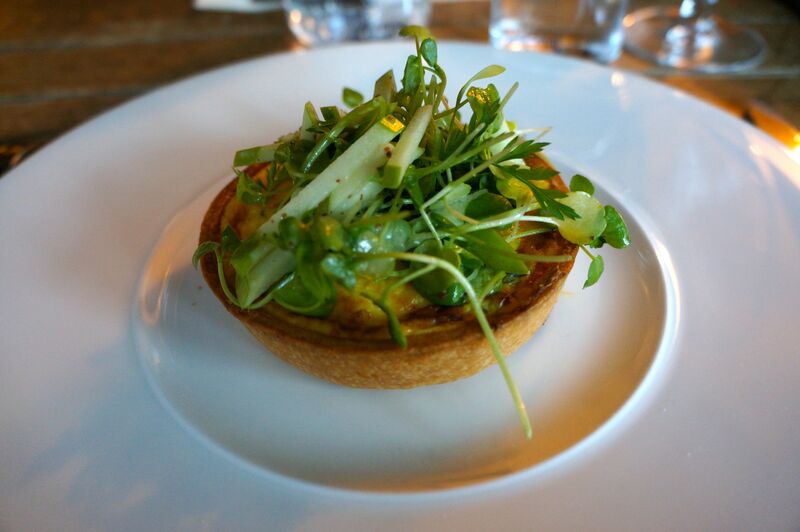 To start, our favourite was the ‘Asparagus’ – a tart of thin crispy pastry filled with a light cheesy filling of Old Winchester, and a crispy fresh topping of finely sliced apple and watercress. For main, the star of the show was the ‘Chicken’ – roasted chicken breast that had been cooked first in a water bath to retain its moisture and then pan fried to give a deep rich tasting skin. It was by far the best, most perfectly cooked chicken I have ever tasted. It came with what the menu referred to as ‘chicken ravioli’ which was an almost pate like chicken filling wrapped tightly in a cabbage leaf and served with spring vegetables, wild mushrooms and a rich delicious gravy. For dessert, we shared the ‘Strawberry’ which consisted of two shortbread biscuits filled with a strawberry bavios, vanilla ice cream and strawberries marinated in a fresh strawberry syrup that had a lovely zing and took me back to my childhood when I used to enjoy long strawberry sherbet straws. The food menu cleverly recommends wines to accompany each dish sold by the glass and there is a well-stocked wine cellar. You could be forgiven for leaving the car at home and enjoying a long evening of wine tasting here. There are some great English wines on the menu, but we opted for the Pinot Noir, Wingspan which had a good depth of flavour. A friendly local restaurant serving exceptional food that makes the most of what’s on its doorstep. We visited on a sunny Friday evening and so the bar area to the front was full of people enjoying an after work cocktail or beer. A piano player was providing the tunes and stepping up in to the restaurant area, there was a nice low level buzz of happy diners. Our waiter was extremely helpful, efficient and chatty. He knew the menu like the back of his hand and helped twist our arm in to trying the beef dripping and the sticky toffee pudding – for which we will be forever grateful! Being situated across the road to Smithfields meat market means that produce is fresh, British and of amazingly good quality. To start, we indulged in beef dripping with warm crusty bread – heaven in a bowl and we could have gone on eating it all night, although our arteries wouldn’t have been overly thankful. We then enjoyed the duck spring rolls with a hoi sin sauce. Perfectly crispy, packed with filling and a decent sized portion to kick-start the evening. For main, I opted for the Hereford beef fillet with shared sides of champ potatoes and greens. The beef was melt in the mouth delicious and cooked to perfection. For dessert, we shared a sticky toffee pudding – it’s worth a visit just to try this perfectly spongy oozy rich dessert. As I’m currently pregnant, I was pleased to see that non-alcoholic Becks Blue was on offer in the bar, and so enjoyed a nice bottle with lime to start the meal. There’s a good wine selection available by the bottle or the glass with easy to understand titles and descriptions such as ‘light and easy drinking’. My partner opted for a glass of ‘juicy and ripe’ Tarquino shiraz/malbec, which he said accompanied his steak well. Great steaks in a relaxed atmosphere using the best of British produce. With its grand first floor conservatory windows visible from the high street, the Signor Franco restaurant has been a part of Tunbridge Wells for almost 20 years. Upon entering, guests are warmly greeted by the friendly Italian staff and a cosy roaring fire. There are three parts to the restaurant, a cosy lounge style eating room, the brighter conservatory, and a comfortable lounge area with sofas for pre or post dinner drinks. The owner, manager, waiters and Chef ooze Italian sophistication, humour and charm, and were on hand to greet new guests, chat with regulars and assist with the menu. All were as equally passionate about the food and the restaurant and did their upmost to ensure guests had an enjoyable evening. Produce is sourced fresh and as locally as possible. The Executive Head Chef, Francesco Furriello told us how his family back in Italy own a fish mongers and so he ensures that only the freshest of squid and fish are supplied and served at the restaurant. To start, an amuse bouce of cream cheese with salmon in a small pastry cup sitting on a bed of minature leaves and dill got the palette going. The starters came next, our favourite being the creamy Puglian mozarella. It arrived on a bed of fresh Italian tomatoes that Furriello has shipped over daily, grilled aubergines and basil oil. The cheese looked like a perfectly poached wobbly egg sitting plump and glossy on top until I cut in to it to reveal a creamy rich centre. For main, the meaty skate wing with butter and capers was perfectly cooked and accompanied with sides of salty crunchy fried courgettes and dark rich spinach. For dessert, the homemade ice cream stole the show for flavours, with everything from peanut butter to liquorice. I opted for a mix of Bellini, and pineapple – each with their own sharp tang and a perfect end to the meal. We enjoyed our petite fours and peppermint tea in the lounge with a shot of grappa and a limoncello. To start, we enjoyed a non-alcholic mojito from the enticing cocktail menu. To accompany the food, we tried a glass of the Borgo Coventi which had such good flavour that Signor Franco first tried it, he had the whole vintage bottled for the restaurant and so it is the only place that it can be bought. There was also a good selection of after dinner aperitifs such as Barolo Chinato, which apparently helps to aid digestion. Deliciously fresh Italian food in a warm and welcoming environment with excellent service. A stroll through St James’s Park, and a wander around the grounds of Westminster Abbey… Blue Boar Smokehouse is situated in a great part of London. We entered through the well stocked bar filled with comfy armchairs and some comical artwork and models of key political figures. The restaurant is situated at the back of the restaurant. With a completely different feel. Infact you could be forgiven for thinking you’d stepped on to a luxury cruise ship. Immaculate wooden clad walls, a singer playing on his guitar, long leather seats and crisp white tablecloths with drinks lining up and food standing to attention under the spotlights. Service was friendly, polished, chatty and nothing seemed too much trouble. We visited on a Sunday where all you can eat starters and desserts were available and endless Bloody Marys or Bucks Fizz. Carved ice blocks sporting king prawns, cockles and mussels, bowls of tasty salads like smoked feta cheese, shaved fennel, pomegranate & toasted pistachios, and a butchers board table containing venison pastrami with pickled cabbage and smoked almonds plus pig’s head terrine, salami’s and a selection of homemade pickled herrings and sunblushed tomatoes make it extremely tempting to just eat and eat… a word of advice though – don’t get overly excited and fill up on the starters because there’s sooo much more great stuff to get through too! For main course there are a variety of dishes all cooked on the American pit to tantalise your taste buds, from a traditional Sunday roast to seabass with preserved lemon, samphire and fennel. 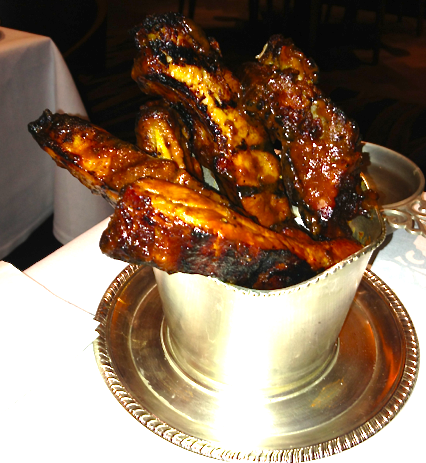 Our favourite though was the Blue Boar ribs. Smoked in-house and rubbed in their own special secret blend of spices, they were huge and served oozing out of a silver bucket – finger licking good! Dessert was an amazing array of masterpieces from chocolate brownies cake to crème brûlée and homemade fudge and nougat. We could have stayed all afternoon picking and eating all of the different delights on offer. A huge amount of great food with good service in an interesting location. Perfect for a large group on a Sunday or a mid-week work lunch. Another new addition to Petts Wood is this new venture from Atul Kochhar and Jitindar Singh, two highly experienced people with a passion for Indian food. Unlike Atul’s Michelin starred restaurant Benares, Indian Essence (named after Kochhar’s first book) is a more relaxed local affair but serves the same high standard of food and interesting flavour combinations. Service ran like clockwork with a team of around three waiters serving at different points throughout the evening. Jitindar was on hand to make recommendations and introduce the dishes. Indian Essence features traditional Indian Cuisine with Western touches using the finest of seasonal ingredients. At the beginning of the meal we were presented with an amuse-bouche of spiced potato cake and mini papadums with three small glass jars of chutney (pineapple, ginger and green apple). 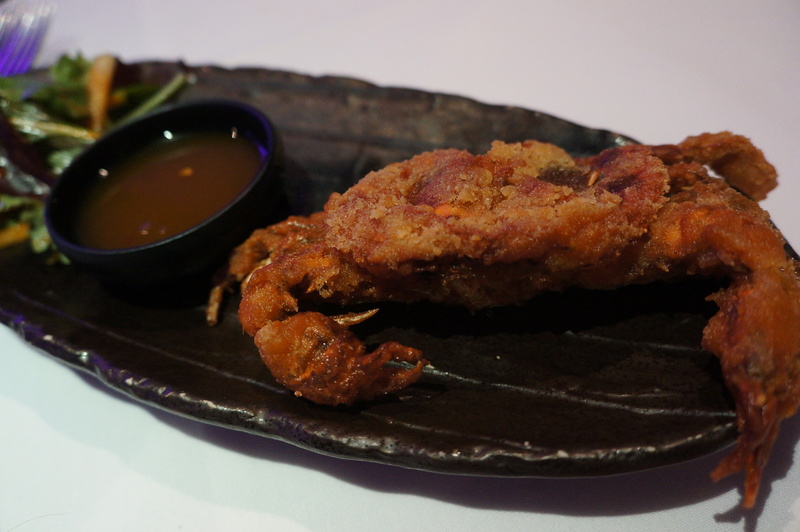 To start, our favourite was the soft-shell crab with corn and apple salad with a sharp dressing that went very well with the crab. For main, it was hard to choose between the perfectly cooked and freshly grilled seafood and the slow cooked lamb neck fillet. Both were full of flavour and beautifully presented. The Samudri Khajana Do Piaza was made up of king prawn, scallop, razor clam, salmon and squid and served with a tomato-onion sauce. The lamb came with turnip and a perfectly spiced sauce that went well with our sides of baby aubergines, new potatoes in mustard seeds and garlic naan. Dessert was a clever twist on a British classic, cinnamon apple crumble with a ginger and cardamom custard – I do hope that Mr Kocchar shares the recipe for this one day! There is a fairly extensive cocktail list with the pineapple and ginger Mojito taking our fancy. The wine list is also good with some of Atul’s Signature Sauvignon Blanc from Hungary making an appearance. 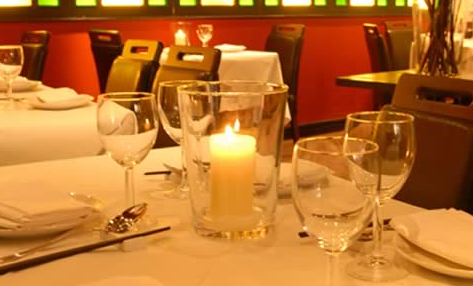 A superb Indian restaurant with slick service, a great atmosphere and exciting flavours in the heart of Petts Wood. Murinci is a fairly new addition to Petts Wood offering a fine dining experience with a European menu and a strong Italian influence from Head Chef Tony Locke, who currently also works alongside Aldo Zilli as his home/food economist. 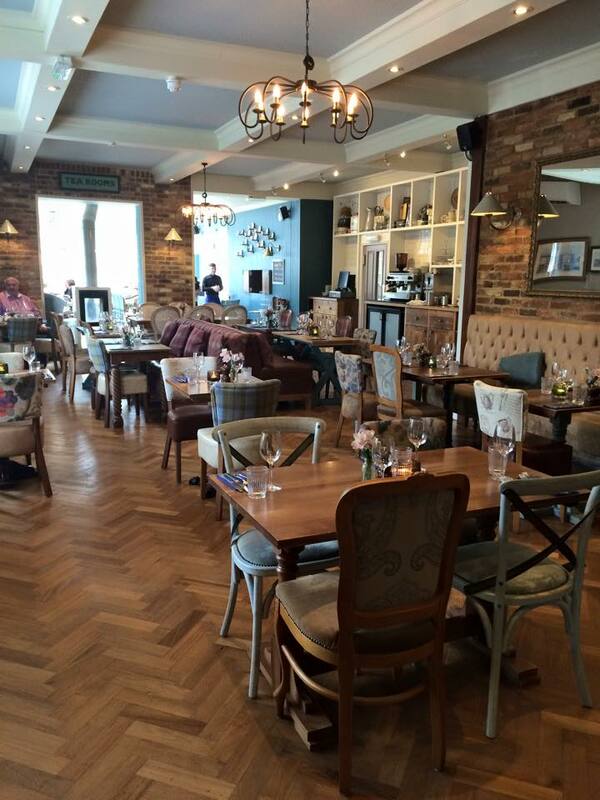 The restaurant has been newly refurbished to a very high standard and is situated just opposite the train station. It also has a great outdoor space to enjoy when our warm afternoons and evenings finally arrive. Service was very friendly, efficient and welcoming. The owner, Inci was on hand to ensure guests were happy. She talked them through the menu and provided information on where produce is sourced. menu with mains starting at around £10. There is a great selection of fish, meats, pastas and vegetarian dishes and all produce was extremely fresh and of great quality. At the beginning of the meal we were presented with a large board of homemade breads, olives and oil. All were absolutely delicious with flavours such as walnut, tomato and a perfectly cooked foccacia. To start, our favourite were the fresh king scallops – suitably plump and cooked to perfection with a pea and mint puree, pancetta crisps and confit tomato dressing. For main the crispy suckling pig cooked in cocoa butter served with spiced apples, spinach and cinnamon infused jus stole the show. The meat melted in the mouth and the portion size was overly generous. Dessert had some unusual flavour combinations, our favourite being the baked peaches with rosemary ice cream and a dusting of chocolate. The ice cream was homemade and its delicate hint of rosemary worked extremely well with the sweetness of the peach. There were a nice selection of wines available and the Sauvignon Blanc served by the glass went very well with the scallops. There was also a good selection of Champagnes and sparkling wines available with pre-dinner cocktails on the menu of Bellini and Kir Royale. A comfortable fine dining restaurant that’s perfect for a special occasion or to give yourself a well deserved treat. 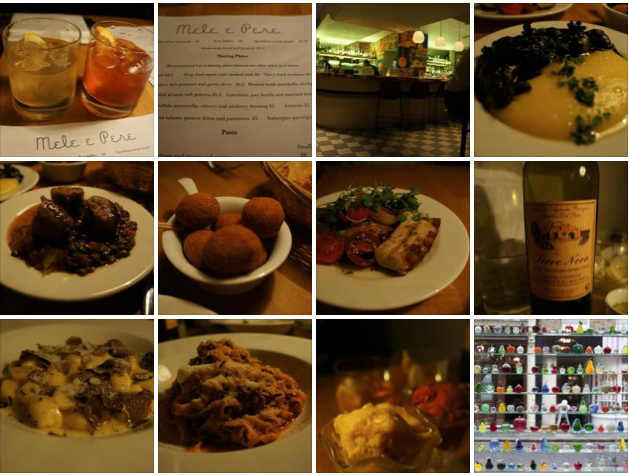 You may be forgiven for thinking upon first glance that Mele e Pere is simply a shop selling colourful glass apples and pears, however look beyond the shelves and you’ll realise that it is infact a modern trattoria serving authentic Italian food. Customers can take an informal seat upstairs at high tables, at the sweeping well stocked and colourful bar downstairs, or huddled around dining tables with low lighting and great buzzy underground acoustics. Service was relaxed and friendly. We had 3 different people taking care of us, all very aware of what was going on and all as equally helpful. They worked the room and explained the menu with ease and all seemed extremely experienced in their knowledge of Italian cuisine. Mele e Pere has a newly refined, well-formed menu starting with sharing plates, of which it is recommended that you choose 3 or 4 between two as a starter – prices begin at £3.50. We opted for Grilled octopus, new potatoes and green olives (which arrived looking like strips of pork belly, and were just as juicy) Cotechino, Puy lentils and mustard fruits (Christmas on a plate! ), cuttle fish alnero with soft polenta (melt in the mouth tender cuttle fish, and enviously well cooked polenta) and spicy fried ascolana olives (these babies are hot hot hot!). For mains, we opted for the Tagliatelle with beef ragù and the Potato gnocchi with Italian black truffle and white truffle oil. Both were full of flavour and perfectly cooked. The menu has the option of small or large portions – we opted for large, but due to the rich starters, the small plates would have been more than enough, and have left room to try one of the richer desserts on offer. With full bellies, we couldn’t handle more than a homemade sorbet, but what a great choice it was – one mango and one blackberry. Just the right amount of tang, and silky smooth on the tongue. The wine list is way too tempting – some amazing Italian wines at fairly reasonable prices are on offer as well as a couple from France and Spain under a heading of ‘Neighbours, Brothers and a Third Cousin Twice Removed’. We opted for a very meaty, full flavoured red from Puglia. We also had to try the very moreish, homemade vermouth, a sweet red and a floral white – both perfect to start and end the meal. 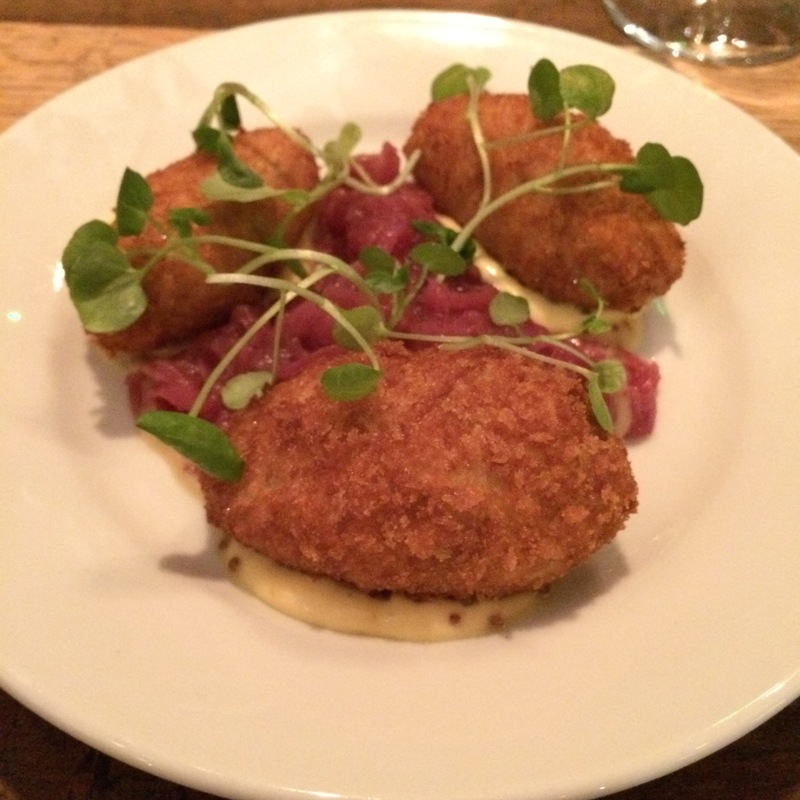 Great food, great wine and good buzzy atmosphere – one of my new Soho favourites! An invitation to YO! Sushi to try their Ramen when it’s so hot on the foodie agenda was a treat. We hitched up at the Southbank restaurant complete with mod cons like still and sparkling water taps on each table, and the famous conveyor belt of smaller sushi dishes whizzing around on a very chilly evening. A bizzy, buzzy atmosphere and friendly staff greeted us and made us instantly welcome. We were well looked after by the staff, and were fortunate enough to meet YO! Sushi’s Executive Chef, Mike Lewis who told us how he created his vision for Ramen with toppings to suit individual tastes and to provide diversity. We started with some tasty small plates of pumpkin karroke (sweet and crispy) , chicken and duck guyozas (moreish dumplings with dippy sauces) and chicken katsu (breaded chicken fillet on leafy cabbage) and then moved on to the main star of the show – the Ramen. We chose to share a Chasiu Pork Ramen (we had to try this one as Mike had told us it was his favourite!) and a Kaisen fishcake Ramen and then added garlic puree that packed a punch, sesame and chilli oil (don’t get them mixed up, they look very similar in colour!) and a little soy sauce. 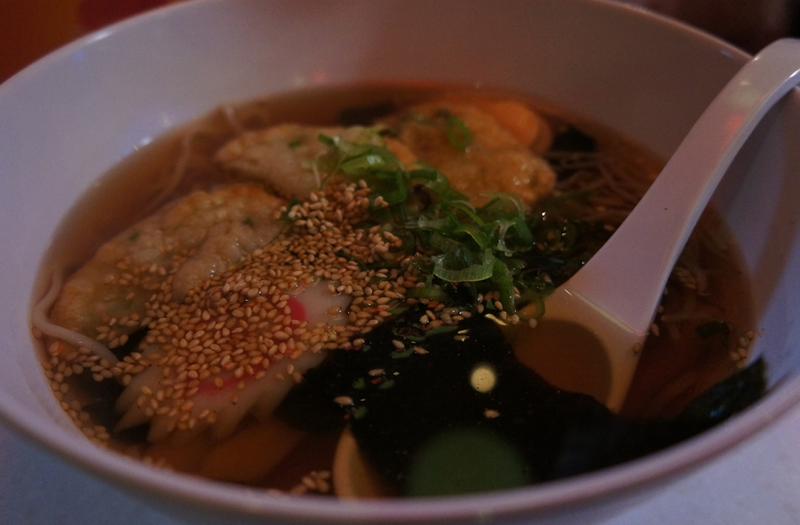 My favourite was the fish Ramen mainly due to its broth. We were told that all Ramens have the same broth, but the sweetness of the fishcake definitely added a little something extra. I have to admit that I’ve not tried Ramen before, and so without anything to compare it to, I couldn’t say whether this was the most amazing or the worst in London, however I enjoyed it, and it was just what the doctor ordered on a chilly evening with the tail end of a cold, and hungry belly. I can’t stop thinking about this place. There are some little finds that you just want to keep for yourself, or live in and this is one of them. I love everything Spanish, and walking through the huge doors and heavy velvet curtains to the dark, wood panel and brick walls of the railway arches makes you feel as though you’ve stepped straight in to a little slice of underground Spain. Dark, moody Goodfellas style lighting, a long sweeping wooden bar, racks of the finest sherry and wine, a fridge stacked with Spanish cheeses, and at the back two masculine Spanish men carving wafer thin slices of jamon. 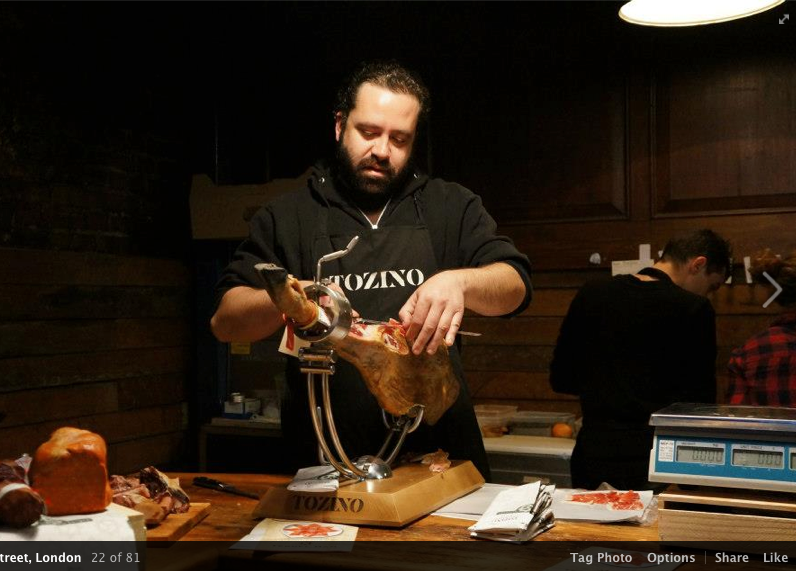 Tozino is a special place. Only having received its licence recently, and opening up its bar, means the staff are still getting to grips with things, but that didn’t matter because they did everything with a smile and genuine flair, and you’re sitting in an amazing place, so they just can’t do anything wrong. Simple, but the best of produce. The menu is written in Spanish, so go prepared, or ask a member of staff to translate for you. It’s basically Serano hams (of different varying quality – the jamon joselito gran reserva being the best! ), Spanish cheeses – one of which is like a manchego but dare I say it, even better, Membrillo (quince jelly) and tomatoes on bread… and if you want you can have that all in a bap or on boards with bread sticks and chorizo. Laid back, simple. Very dry, very cold sherry. Very sweet, very cold sherry. Cava sold by the glass, great red wines, great white wines… try them all! you won’t want to leave anyway. Try this place on your own with a very good friend/partner first, because trust me, you won’t want this secret to get out! Like stepping into a bar/restaurant in Ibiza (even though it offers Italian cuisine), Disiac oozes cool sophistication without being pretentious. The are two main seating areas, one to the back behind a DJ booth with a more traditional table and chair set-up, and to the front there are comfy white seats set around the open kitchen with a glass bar containing lobsters on ice. Service was great, we were well looked after by out waitress, who recommended dishes to try and kept our glasses topped up with Prosecco. The owner and head chef, Michele de Rosa (previously at Cecconi’s) was also on hand to ensure things were running smoothly, and to recommend the ‘Apostle’s fingers’ for dessert. Inspired by a family recipe, they were the perfect way to end the meal. If Disiac had opened in June as originally planned, I can imagine the place would have been heaving every day of the week with beautiful people sitting in the large open windows supping on Prosecco and shooting oysters. In the winter, however I imagine the homely Italian pastas and meat dishes are going to be the thing that attracts customers. We pretended it was summer, and so opted for the seafood platter. 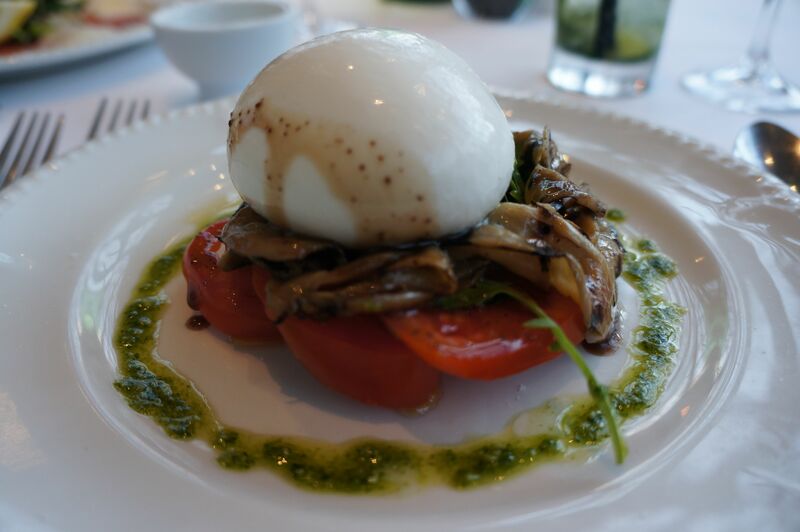 To start, I had the Buratta salad – an amazing cheese that’s made with mozzarella and cream… believe me, it’s worth a visit just to try this! 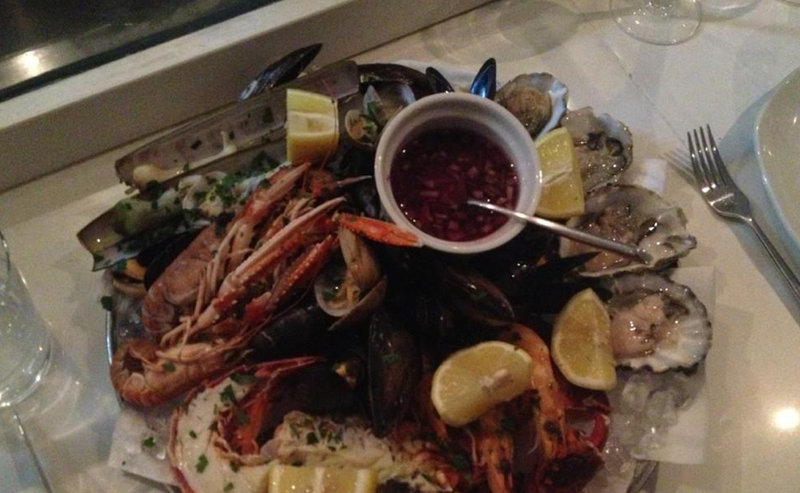 Our seafood platter was jam packed with a mix of warm and cold crustacea. Lobster, langoustines, oysters from Colchester, king prawns, razor clams, clams and mussels all perfectly prepared and delivered for a reasonable £32. There were two choices for dessert – their own version of Tiramisu, which suited our taste buds perfectly because it had more cream than coffee, and the Apostle’s fingers, which consisted of tightly rolled pancakes with ricotta and chocolate sauce. Sparkling wines are the main focus at Disiac, and we adored the Prosecco. The house white also had great flavour and a crisp finish that complemented the seafood well. There’s also a 20-strong cocktail list, which we didn’t get to try but will be back for! It was the RudeBarber that took my fancy. A great place to start or end a night in Soho. Either for a great meal full of fresh produce, or for a cocktail and a dance with their resident DJ. 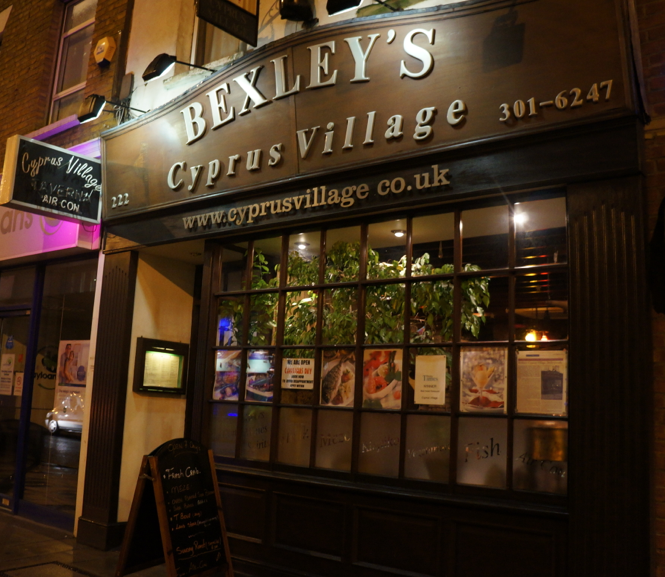 Stepping in to Cyprus Village, you instantly feel transported to a traditional Cypriot restaurant. It is relaxed, homely and inviting, a place that individuals and couples can enjoy as well as larger groups. Service was warm, welcoming and relaxed, and the owner and Chef for the evening, Arif made sure to take time out to chat to his guests. With such a great selection on the menu and everything made from scratch, we opted for the Meze so that we could try different small dishes of the cold and hot authentic Cypriot cuisine. Our favourites were the stuffed vine leaves, the spinach and feta parcels and the succulent barbecued lamb, beef and chicken. The house wine was very reasonable and extremely drinkable, and to finish the meal a glass of 5 star Metaxa made us feel like we were on holiday. An authentic and welcoming Cypriot restaurant, perfect for a family get together over Christmas. A warm inviting glow of candles from the windows of a beautiful 17th Century building welcome you in to a comfortable and sophisticated restaurant. Tables of families, couples and friends enjoying a Friday night treat add to the homely feel of Thackeray’s. The service was almost army-like in its efficiency; with staff standing to attention with trays of amazingly presented food. Their warm smiles and assistance with the menu though added a personal touch to the evening. After hearing that Thackeray’s had just regained its Michelin star, we knew the food was going to be good. Produce is locally and seasonally sourced from only the best suppliers, and this is reflected in its range of menus. There’s an A La Carte menu that changes frequently, a Market menu that changes to reflect daily availability, and a seven course Chef’s tasting menu. We opted for the tasting menu, with little bursts of flavour and a surprise in each dish. Our favourites were the maize fed chicken coq au vin ballotine, served with a crispy chicken wing package and seasoning to die for. The baked wild sea bass fillet as the main dish with roast Scottish langoustines, squid ink linguine, buttered leek and oyster broth and a mouth popping poached oyster was amazing. 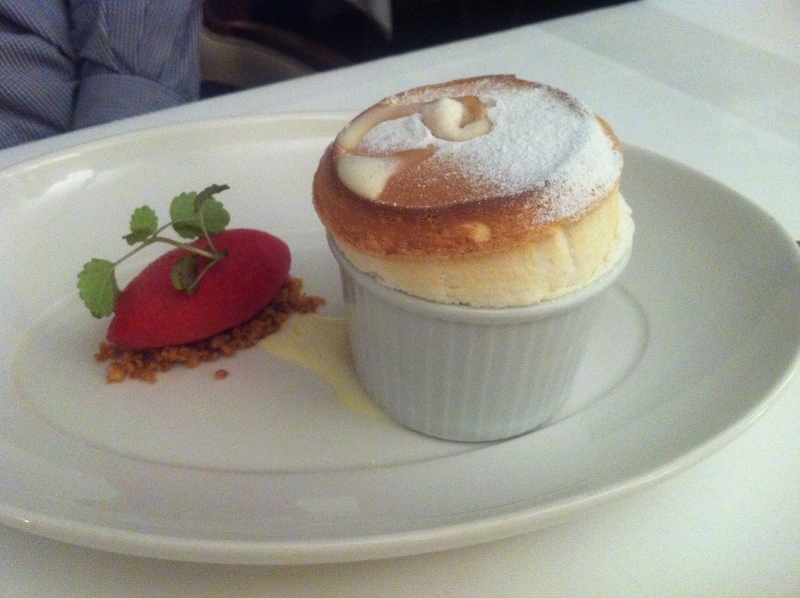 The real show stopper though, was a Sicilian lemon soufflé served with a hot white chocolate sauce and raspberry sorbet – like a warm silky marshmallow that melted in the mouth and left you wanting more. An inviting cocktail menu, and an extensive wine menu with good English wines available. We opted for a cherry bomb to start – a sour cherry brandy cocktail that warmed you up on a chilly evening. For a little extra, guests can opt for a glass of wine to be paired to each course of the tasting menu. Perfectly presented masterpieces of food served in a warm homely setting. 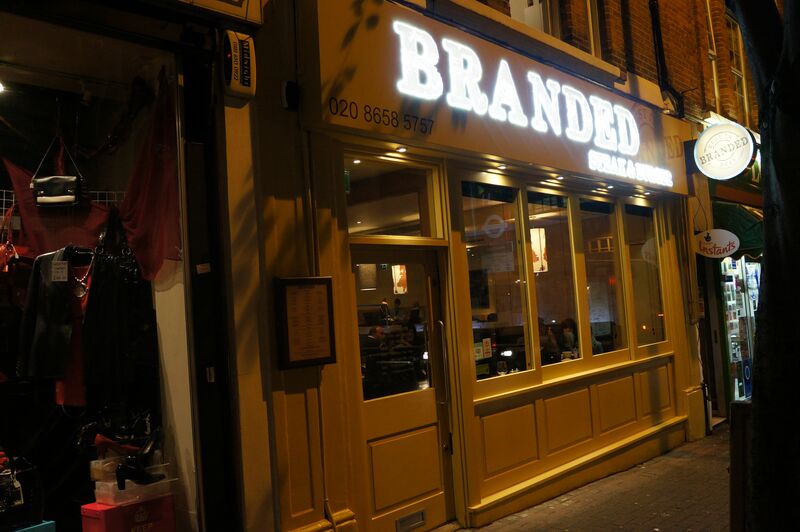 Branded has an informal feel, with wood walls and an open kitchen. The restaurant was buzzy when we arrived, with people celebrating and regulars enjoying a good steak on a weeknight. The owner is very personable and he’s supported by an efficient and friendly team. Drinks were topped up, recommendations were made and their cheery manner helped to lift the mood of the guests. As well as high quality 28 day hung Aberdeen Angus Scotch beef from only the happiest of cows, Branded also have a tasty selection of fresh fish and seafood on their menu. There’s even a roasted vegetable lasagne to keep the non-carnivores happy – but this is definitely a place for the serious meat eater. I started with the seared diver caught scallops – they were meaty, perfectly cooked and served with ultra fresh asparagus and a sweet oriental sauce. For main we opted for the Chateaubriand – 600 grams of pure melt in the mouth heaven, shared between two and enjoyed with a béarnaise sauce and sides of creamy umptuous mash and a bowl of rocket and parmesan. There was no room for dessert after this, but the tempting sound of great British favourites like apple & blackberry crumble, and sticky toffee pudding will certainly see us going back for more. A good selection of wines by the bottle or the glass, served in cute glass carafes that make you feel a little like you’re on holiday. The Italian house red was plenty good enough to complement the meaty flavours with notes of berries and plum. The perfect place to enjoy great steaks and fresh fish. A recently renovated busy local with a great outdoor area to chill in and feel like you’re on holiday, a cozy lounge area to enjoy a Sunday pub quiz, and tables set up for intimate or group dining. Service was uber friendly. Every member of staff seemed like they were genuinely enjoying themselves whilst being totally professional, and knew exactly what was happening with each table. We visited The Shaftesbury on a Sunday and so one of us had to take advantage of the Sunday roast menu – my partner had the Sirloin of beef with Yorkshire pud, Goose fat roast potatoes and a large side helping of veg. I opted for the fillet steak, which is cooked on a super-hot charcoal grill with different weights available throughout the day being marked off as they sell out. I had the 200g with tarragon butter and it was more than plenty to fill me up, along with the accompaniment of twice-cooked chips and rocket & parmesan salad. To start, we’d chosen lighter dishes as we knew we’d have to make room for the mains, and the favourite was the pan seared scallop gratin – 3 deliciously well cooked scallops topped with a lobster bisque and bread crumbs. To finish, we shared the ‘Shaftesbury Mess’ – a special take on Eton Mess that has a perfectly cooked meringue, served in a large mixing bowl with wooden spoon and pots of Chantilly cream, strawberries and clotted cream on the side. After smashing up the meringue and arguing over whether we should or shouldn’t include the whole lot of clotted cream, we were suitably stuffed! We visited the day after ‘National Gin Day’ and so started our meal with a refreshing Sipsmiths gin and tonic. We followed this up with a nice and reasonably priced Rioja, and finished with a peppermint tea. Being part of the Young’s Brewery meant that an extensive list of well-known and local beers were available, as well as every kind of spirit you could want for. A comfortable, welcoming local with a great buzz and delicious food. I’ve often walked past San Bas assuming that it was more of a lunch time destination rather than an evening restaurant. However when we visited I was corrected and pleasantly surprised. San Bas is a great buzzy restaurant with a really personable owner who welcomes everyone as if they are his best and most valued customer. Service is slick, friendly and effortless. We overheard one diner requesting for a slight change to a dish on the menu and this was no problem at all. Large and small tables were all well serviced, and drinks replenished throughout the evening. The quality and presentation of the food at San Bas is amazing. When reviewing the menu online before we arrived, I was a little concerned that it looked like a bit of a mix match of different cuisines with no real focus, however once we were there and understood that the menu has been thoughtfully put together to cater for everyone’s different tastes, it became apparent that actually, the proposition is a great one. A large group of friends could all quite happily be catered for here whether they wanted Italian, Mexican or just a really good steak. Our favourite dishes were from the seasonal specials of the day. To start, a deliciously simple and ultra fresh plate of Kent asparagus topped with a perfectly cooked poached egg and balsamic glaze. For main a good portion of sea bass served on a bed of prawn risotto. 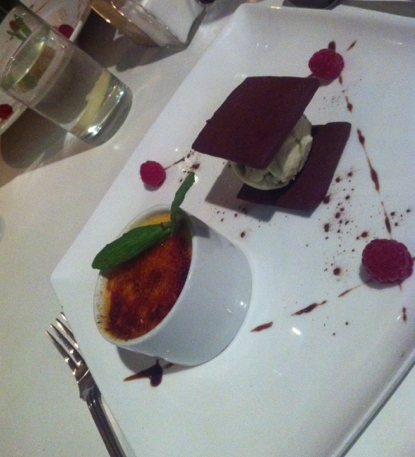 Dessert was a beautifully presented Crème brûlée with pistachio ice cream sandwiched between handmade bourbon biscuits. The wine list had a great selection with full or half bottles available, as well as a good variety by the glass. I opted for the Shiraz, served in a nice large red wine glass at the perfect temperature. A well stocked bar also offered various spirits and beers, and a nice fresh mint tea ended the meal perfectly. A buzzy informal restaurant with amazingly good food to suit everyone’s taste. Gavin Greggs is set in a cosy period property that dates back to the mid-17th century. The warm glow of candles in the window – visible from the top of the High Street, reflects the welcome received as you step in to the restaurant. Owner and chef, Gavin was on hand to welcome and introduce the specials from the days menu, and his front of house was just as enthusiastic and attentive. Service was spot on. Wine suggestions were provided, and dishes introduced and well presented. The whole evening ran with efficiency but also a genuine friendliness that made us feel welcome and looked after. We were almost tempted by the tasting menu at £45 per head excluding wine (or £60 including wine) however as it was mid-week, we thought we’d stick to just the three courses! To start, I had the Chicken liver parfait with apricot and tomato chutney, quince jelly and pistachio brioche. It was absolutely delicious – the quince jelly gave a different dimension to the texture, and there was a zing in the chutney that really complemented the parfait. For main, my partner opted for the Kentish lamb rump with lamb shoulder, which was beautifully presented with the mixed vegetables served in a cute saucepan on the side. 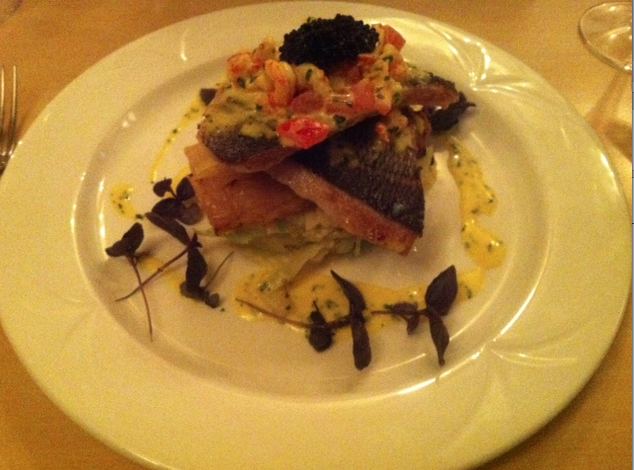 I chose the locally sourced fish of the day – Black Bream served on a bed of potato gratin and braised cabbage, topped with crayfish tails, a deliciously rich and creamy sauce, and a good spoonful of lumpfish caviar. The bream had a really meaty fresh flavour. All portion sizes were extremely generous and so as much as I’d have loved the cheeses supplied by ‘The Cheese Harp’ located opposite, we just didn’t have the room – so we decided to share a dessert of poached rhubarb with apple pana cotta, ginger bread and vanilla bean ice cream. A lovely end to an amazing meal. A good selection of wines that are reasonably priced. We had the house red – a Chilean Merlot with good flavour that complemented the lamb. The tasting menu cleverly suggests wines to accompany each of the dishes offering a good variety by the glass. A cosy and friendly restaurant with Michelin Star quality food. We visited on a Sunday afternoon and there was a nice hum and mix of people reading papers, drinking coffees and tucking in to roast dinners. I’ve also been to The Refinery on a ‘work night’ for drinks before, when it’s a very different kind of vibe and is more of a lively bar. On both occasions though, it had a very laid back and welcoming feel. Staff were very friendly and attentive and it seemed that they all got on well as a team, as well as interacting with customers which is always nice to see, because you get a sense that they’re genuinely happy to be there to help, and enjoy their job. We opted for the roast – how could we have gone for anything else when it looked so delicious? A silver tray of mixed veg and roast potatoes came out for both to share and serve ourselves, and then a plate each containing our meats and Yorkshire puds. I had the beef, which was succulent and delicious and my partner had the pork, which was just as tasty – unfortunately the crackling wasn’t as crispy as we’d have liked it to have been, but it still had good flavour and a nice chew to it – the apple sauce was great! I don’t know how we found room after such a large main, but we shared a lemon peel crème brûlée for dessert and were so pleased that we did – creamy, and full of flavour you have to try it. As it’s also a bar, there’s every kind of drink you could want available. I’d heard great things about their Bloody Mary’s – of which there are six different versions of on their cocktail menu! 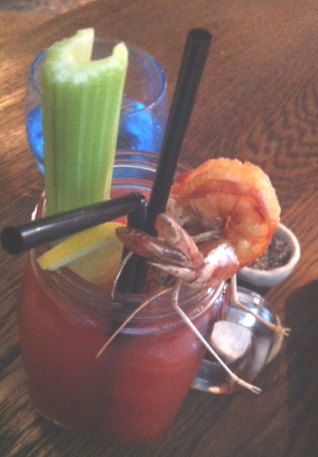 And so I tried the Bloody Caesar – a good bite of chilli and served with a grilled king prawn on top – it was a-m-a-z-i-n-g and just what Sundays are all about. The perfect place to chill on a Sunday with friends, good food and a Bloody Mary. The Bakery is a fine dining restaurant that also has a bar selling smaller dishes throughout the day and evening. Currently undergoing some great improvements to support the Olympics by providing ‘rooms’ as well as extending their kitchens, The Bakery will be closed for March – so ensure that you call and book before it re-opens to secure your place at a table! The owner, Andrew cares very much for his local regulars, as well as making every effort to welcome newcomers to the restaurant as they walk through the door. He also helps with wine recommendations, and even makes his own chocolate truffles, presented to diners at the end of their meal. The menu has a nice variety of around seven different options for starters and main courses. veggies, carnivores and pescaterians are all catered for. We opted ‘carnivore’ all the way for our visit, starting with the chicken, bacon and prune terrine – great flavor and a very decent sized portion, followed by the roast rack of Salt Marsh lamb with celeriac puree and red wine jus. All mains were accompanied by a good helping of fresh seasonal veg and crispy roast potatoes. For dessert, the homemade apple and vanilla custard tart hit the spot with a drizzle of chocolate sauce. Where possible, food is sourced locally and is served in record time, without compromising on quality. The wine list had a great selection from different regions around the world, and the Rioja that we chose was served at a perfect temperature being topped up throughout the meal. The bar is also well stocked with various liqueurs and beers available. A friendly restaurant tucked away in a pretty village with bags of potential. The Vine is just a short walk from Sevenoaks train station, and unless you know the area, you’re unlikely to find it as it’s not located on the High Street, but is instead tucked away in a conservation area surrounded by houses and a pretty green. It used to be a Public House and was renovated by Bernt and Kathleen Bouverie with a lot of class, love and sophistication. The fact that it used to be a pub, means that the space is nice and open, and there’s a hum of conversation when you arrive. The owner, Bernt works the floor extremely well, telling tales of crazy Champagne producers and sharing stories of how they renovated the building. The Maitre D’ runs her team well, and introduced each dish with knowledge and passion. We were opted for the six course-tasting menu at £40 per head. We started with an amuse bouche crayfish cocktail with apple, then a choice of starter – I had the Devon Crab with Seasame crab toast, chilli and a soy dressing. Beautifully presented, and really fresh with a good crunch on the toast. The signature dish followed – smoked Haddock Risotto with a poached egg and Hollandaise sauce. Absolutely beautiful, but a little on the large side – the chef had left the poached egg perfectly plump, ready and waiting for me to break. For main, I opted for the Beef Wellington – another Vine Restaurant favourite with light, fluffy pastry, pink beef and served with a mix of seasonal veg and potatoes. For dessert, we were each presented with a trio of beauties – crème brulee (my favourite), a crisp sweet biscuit topped with cream and fresh raspberries, and a slice of very rich chocolate brownies, topped with a homemade pistachio ice cream. To finish the dish, I opted to a pot of fresh mint tea, and this was served with petit fours that tasted like strawberry ice cream encased in hard good quality chocolate. Bernt is also the Sommelier at The Vine. Having graduated as Sommelier Conseil in France, his well chosen wine list complements the dishes on the menu, and he was on hand to advise which we should pair together with our dishes. A relaxed but well polished restaurant, with friendly and knowledgeable staff. I wish it was my local! 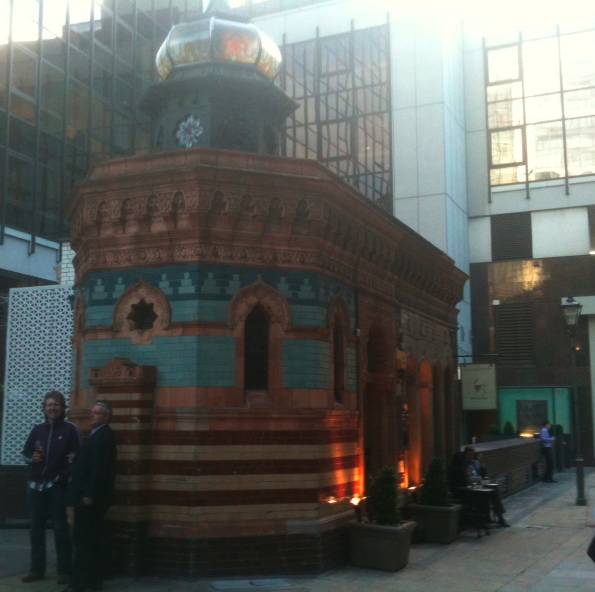 Morgan M is located opposite Smithfield (London Central Markets). It’s nestled among some very trendy, and very sophisticated restaurants serving great food with the best produce available. Morgan M sits comfortably here. It has a quieter, more formal dining floor upstairs, and downstairs, a slightly buzzier feel with open kitchens and large tables accommodating people enjoying taster menus and small plates of exquisite food at a rather reasonable price. Service was warm and welcoming. I was the first to arrive, and was greeted at the door by a friendly member of staff who took my coat and served me a pre-dinner drink whilst I sat on the small sofas to await the arrival of other guests. I didn’t feel at all intimidated or uncomfortable, but very relaxed and well looked after – something that can’t always be said for other upmarket establishments in London! We were treated to a 6 course tasting menu, and being on a table with 5 other fellow food bloggers, the menu was scrutinised, and none of us wanted to miss out – so I actually got to taste all 9 of the dishes available! We started with Cream of Mojette Beans, lemon confit and pesto. The creamy soup was poured over all of the other ingredients at the table by the waiters, adding a little theatre and leaving us in a panic for just a moment when we thought we were just getting three small beans… the dish was a perfect start to the meal – rich, silky and smooth. The second dish was my favourite of the evening. Crayfish and Lobster Cannelloni with Tarragon, Jerusalem Artichoke Soubise, and shellfish cappuccino. I loved the different textures, and the moreish delicacy of the cannelloni. Next came Seared fillet of wild Sea Bass, Carrot and Ginger risotto, lemon and Saffron broth. Surprised to see risotto in a French restaurant, it was cooked to perfection. Just the right amount of bite and stickiness, with flaky clean fish and a crisp, almost crackling-like skin. 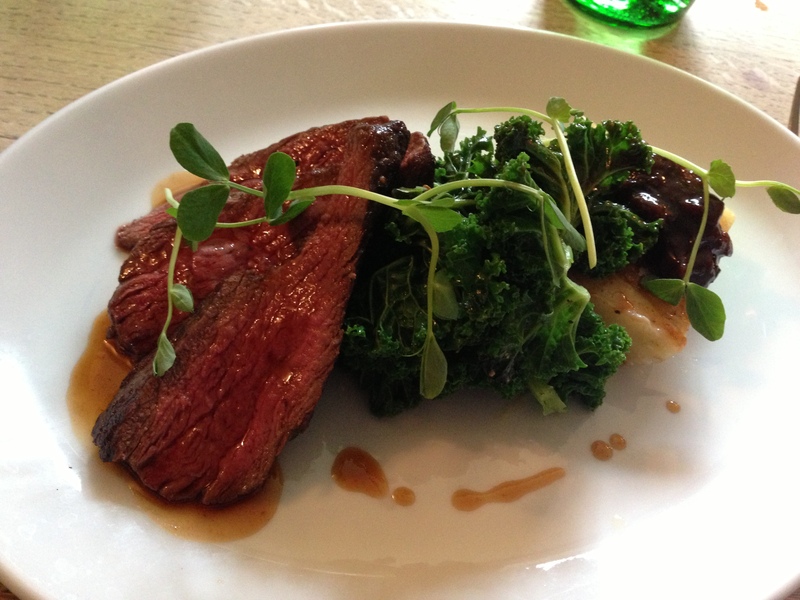 The main dish was pot roasted fillet of Iken Valley Venison, Farci of Hare and quince puree. Sauce Grand Veneur. The venison was perfectly cooked and melted in the mouth, and the sweetness of the quince helped to cut through the smokeyness of the hare. For me the hare was a little too smokey in flavour, but as Morgan M himself told us, he enjoys testing the palettes of his guests, creating conversation around the food. So whilst for me it may have been a little too strong, others absolutely loved it. Desserts were to die for. A vanilla rice pudding served in an orange tuile, and topped with a Pinacolada sorbet… the ladies “oooo’d!” Finally, I had the lightest, sharpest passion fruit Souffle and sorbet with a Crème Anglaise poured in to the middle – to die for! With the tasting menu came some of the best French wines, as well as sherry and port to match each dish. All were matched extremely well, and my favourite had to be the Moscato d’Asti 2010 which accompanied the Passion fruit soufflé perfectly and tasted almost like Fruit Salads! A very approachable restaurant with a wonderful Chef and exquisite food. Morgan himself has a very impressive CV, winning his first Michelin star in the UK in 1999, at Monsieur Max in Twickenham. He has a loyal following from locals of his previous Islington restaurant – also called Morgan M (currently undergoing refurbishment) and takes the approach of building dishes around the raw vegetable ingredients that are in season. This was really interesting for me, because I would normally start with the meat/fish and then match other ingredients to this. You must Go, Go, Go! Situated within the Jumeirah Carlton Hotel, The Rib Room is a pretty impressive establishment – recently updated in décor by the same interior designer as the Dean Street Town house, it has the same comfortable but opulent feel. The Rib Room is celebrating its 50th anniversary, and we were fortunate enough to be invited along to a Burns night celebration in the Buccleuch private dining room. A great room, curtained off from the main restaurant with a sociably large round table. Our meal was accompanied by ‘the address to the Haggis’ and some wonderful theatre from the resident mixologist. Service was exceptional – but then that’s to be expected when you’re being hosted by the award wining restaurant manager ‘Michele’ and his team. The whole evening was slick, relaxed and genuinely friendly, and we wanted for nothing. We were treated to a 5 course Scottish themed menu starting with a rich and buttery crowdie cheese salad served with pickled vegetables, beetroot, roasted walnuts and a crisp bread crouton, then Pan fried scallop, cullen skink (which was like a potato crochet with a cullen skink centre – delicious!) and cauliflower puree. Main course was a loin of succulent, velvety melt in the mouth venison, beautifully seasoned haggis and chestnut casserole with honey and roasted parsnips. Dessert was a beautifully presented three dish tasting menu of cranachan, chocolate and Drambuie mousse (very potent indeed!) and Dundee cake soufflé which I think had to be my favourite. The evening was finished off with teas, coffees and homemade fresh cream chocolate truffles that were so light and rich at the same time that you couldn’t help but go back for thirds! Often in a restaurant the food steals the show, and the drinks never really live up to the glamour however here, at the Rib Room they have Sommelier Louise, who is a very engaging and inspiring person with a real passion for her wine, her cigars and her guests. She has created a wine list that’s searchable via an ipad in the restaurant, containing wines that she’s hand picked and cared for as her babies. Louise is also supported by a great mixologist and bar staff, and we were welcomed with a cocktail that’s possibly the best I’ve ever tasted – invented by Michele, the restaurant manager himself… clearly in this establishment, when a good idea is a good idea, it doesn’t matter who’s it is and that creativity comes across in the solid team that work together. The welcome cocktail of gin, heather syrup and honey can be found here. An amazing evening in a very relaxed and indulgent atmosphere. I’d certainly recommend the Rib Room and will absolutely be going back for more. 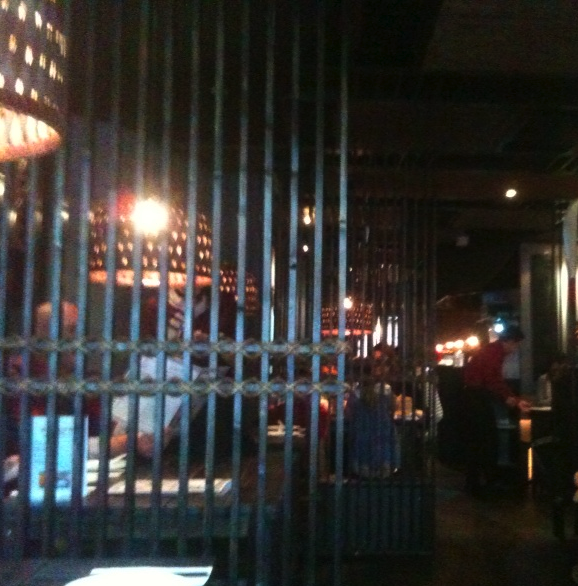 The restaurant was full to buzzing and had a very informal but sophisticated feel. Some people were having snacks and cocktails, whilst others were enjoying a meal with friends and family. Service was very efficient with genuinely friendly staff. The barman made suggestions of a cocktail of the evening upon arrival, and our waiter talked us through the Josper oven and menu. There are different menus for the time of day that you visit. We were there in the evening and so ordered from the all day menu. Our favourite was the pork chop, reared and butchered in Kent, and cooked in a Josper Oven, which cooks at a high heat with charcoal embers, leaving the it extremely juicy and full of flavour. A cocktail bar with a cocktail of the day makes Chapters perfect for a pre-dinner drink, and a very nice wine list complements all dishes on the menu. We went for the Malbec which had great flavours and was priced at £20.50. A great choice for cocktails if in need of a shopping break, or food – whatever time of the day. From the moment you walk through the door, you feel like you’re holidaying in Italy. The staff are bustling around speaking in English and Italian, and the restaurant if filled with sites of fresh fish, seafood, dessert trolleys and Italian wines. Service was warm, welcoming and efficient, with great Italian humour. The menu is very extensive, to the point where I didn’t quite know what to order and so ended up with the waiter making something up for me that was an amalgamation of different dishes. We started with a large plate of very fresh, large oysters, and I had a mix of fresh homemade tomato pasta, served with a perfectly cooked medium rare fillet of steak. Old fashioned Italian charm with great quality produce. We visited Lujon for a special ‘Great 8’ event whereby 8 top chefs from around the UK got together to each inspire an eight course tasting money to raise money for Hospitality Action. Lujon staff worked amazingly well to service a full restaurant and great event, and the restaurant itself really sparkled with throughout the night. Eight courses of excellence worked to inspired themes ranging from ‘Liquid’ to ‘Feathers’. A resounding favourite of our group, was Lujon Chef, Alan Irwins ‘4 legs’ which consisted of a beautifully rich venison shepherds pie. Each dish was accompanied by a matching wine, supplied by Hatch Mansfield. One of my favourites was a wonderfully rich, and honeyed Sauvignon Blanc from Chile, that was served with a blue cheese panacotta and quince, from chef Rupert Rowley. A thoroughly enjoyable and educational evening set in a great restaurant with amazing food. 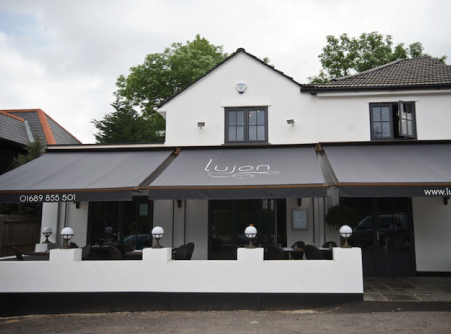 Michelin starred sophistication with a relaxed and stylish décor, nestled in the heart of Kent. We visited on a Wednesday evening and the restaurant had a very relaxed feel with people celebrating special occasions or just indulging in a mid-week treat. Service was perfect. Knowledgeable and friendly staff took care of us recommending wines, seasonal dishes and annotating the delivery of courses with stories from where the produce had come from. The food was exquisite, with all dishes on the menu sounding amazing. Our favourites were the Compression of pig’s head, piccalilli, warm pork bonbon and pickled grelot onion to start – a real mix of textures, flavours and beautifully presented. For main, the Venison had been shot, butchered and prepared by the chef and was melt in the mouth, accompanied with a rich chocolate sauce and a side of extra creamy mash. To finish, guests can opt for an after dinner cocktail from the bar, or if you still have room to fit in a dessert I’d strongly recommend the organic lemon tart. It is served with a crème fraiche sorbet and millefeuille of passion fruit. 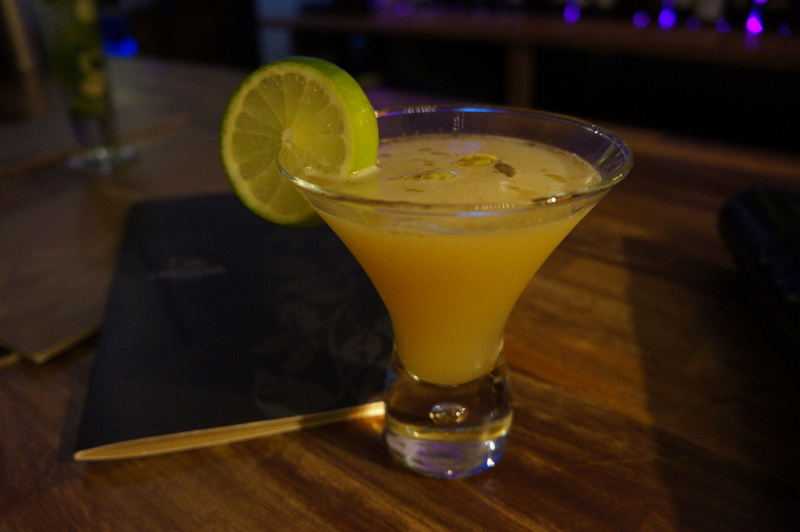 A suitable level of tang from the tart refreshed and satisfied as a perfect end to the meal. Chapter One has a very decadent looking bar, with a great cocktail list. There is an extensive wine menu featuring a selection of wines from their ‘private wine cellar’. Prices started from a very reasonable £19 a bottle, and alongside the food menu, wines are suggested to complement each course. Our waiter recommended Il Baciale, Monferrato Rosso – a great full-bodied red that went really well with the venison. An amazing local restaurant with exceptional chefs and central London sophistication without the extortionate price tag. A stylish restaurant has opened in Holborn, serving high quality authentic Cantonese and Chinese cuisine. They also have two amazing karaoke rooms that can be used free of charge by large groups who dine and eat in the restaurant (minimum spend applies). We visited at lunchtime and the restaurant was full of people nipping in for a bite of good quality, healthy Chinese food. Service was very professional, friendly and considerate to the needs of the customers. Advice was given as to accompaniments to dishes and tea and water was topped up throughout. An inspiring menu with a mix of traditional Chinese and Cantonese dishes with a modern twist. All were beautifully presented. My favourites were the charcoal grilled scallops – fresh and plump, and the steamed tiger prawns with lots and lots of garlic. We could have opted for duck tongues, or snails on ice – but we’ll leave those for next time! A nice selection of good quality wines on the menu isn’t always easy to find in a local Chinese restaurant, but all bases are covered with the wine list at Greenleaf. I’d also recommend the ‘Blue tea’ as a really refreshing accompaniment – don’t worry, it’s not actually blue! A great local restaurant, with good service, good quality produce and a great entertainment factor! Fully booked on a Saturday night, the restaurant was bustling with people drinking cocktails, celebrating birthdays and tucking in to innovative Indian food. Service was friendly and attentive, although some larger groups had a bit of a wait for their food, and so I’d advise though that you book before 8pm to avoid the rush of other diners if there are more than four in your party. A great menu with a real mix of traditional Indian dishes, as well as some new and exciting ones. Our favourites were the roasted scallops with raw mango chutney and the slow grilled sea bass. We could have eaten the freshly cooked naan bread all night! A good strong wine list that was reasonably priced, and a select cocktail list. I’d recommend the Mango Daiquiry. 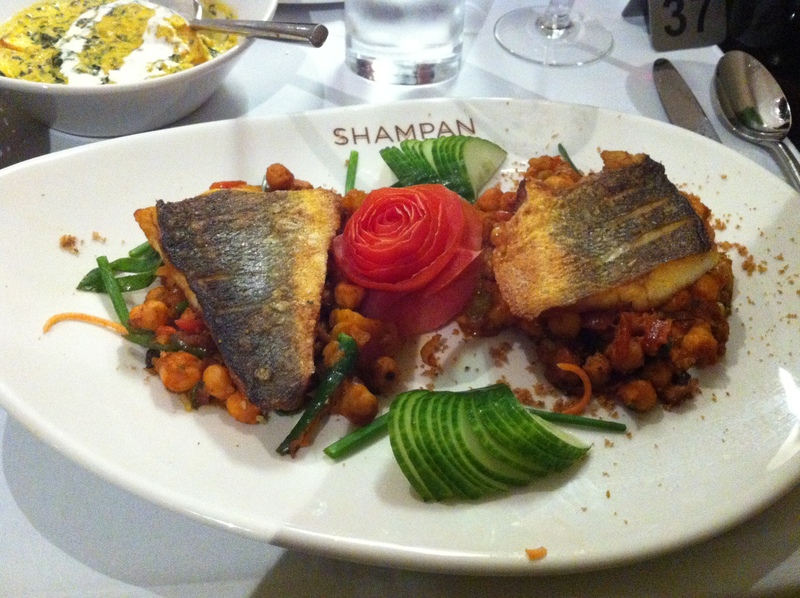 Shampan 4 is a beautifully presented Indian restaurant with an innovative menu. The freshest fish that you’ll ever eat in London. 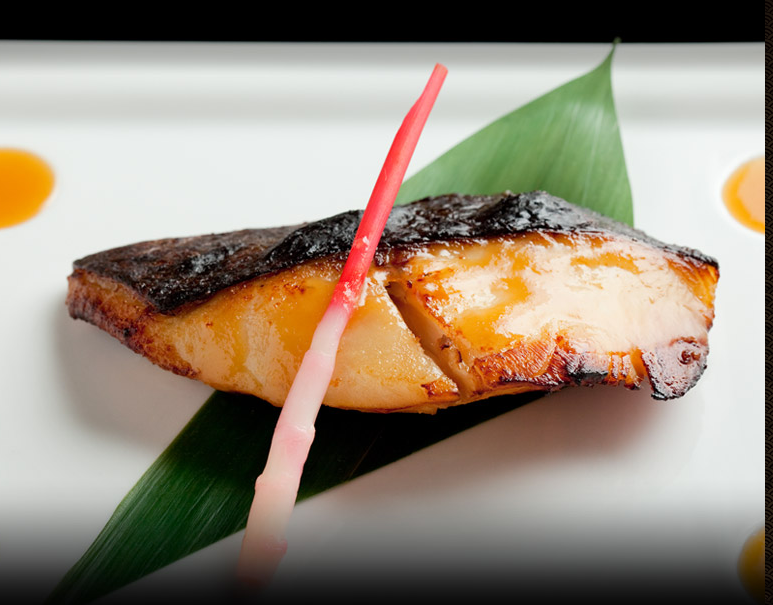 At Nobu, it’s ALL about the food. We were fortunate enough to be taken to Nobu as a wedding gift from our friends Mark & Kelly (thank you once again!) Our sitting was for 10.30pm and so we arrived half an hour early to have a drink at the bar. The whole place was packed full of people enjoying themselves, and staff were buzzing around taking care of every requirement. Staff were very efficient and friendly, and helped to put together dishes for us based upon our requirements. It did, however raise a question at the end of the meal that comes up whenever a bill is quite hefty, and service has been added of 15%, that a new way of paying service needs to be addressed in top London restaurants so that guests aren’t hit with a double whammy when ordering some of the more expensive dishes on the menu. The menu was full of everything that I love. We were so overwhelmed and spoilt for choice, that we decided to ask the waiter to choose for us. He put together an amazing selection of sushi and sashimi. The freshest and meatiest of raw king prawns, tuna, salmon, crab and avocado sushi rolls, and so much more. Prices started from around £3 per sashimi, and went up to £8.50. For main we shared hot dishes of Toban Yaki chicken, Wagu beef (melt in your mouth, and full of flavour), Iberian pork – crispy, crunchy crackling with succulent meat, Black Cod Den Miso, which flaked away and was sweet and delicate, tender Octopus with Yuzu Lemon Garlic (my favourite dish of the night), softshell crab and bowls of the stickiest, loveliest rice. Hot dishes started at around £7.50 and went up to £42. 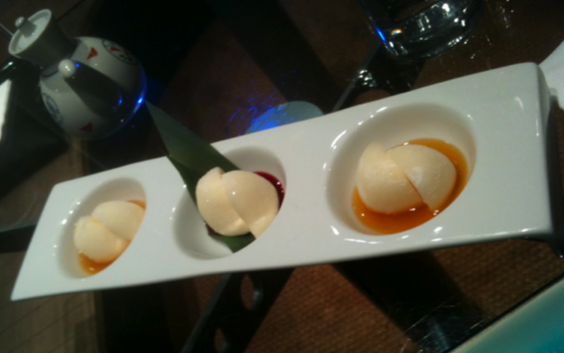 We ended on a high of desserts, the favourite of which seemed to be the spiced warm rice pudding – creamy and delicious. The apple crumble had an amazing twist of Wasabi toffee. All of the food was faultless. Cooked to perfection and from the freshest, finest quality of ingredients. An amazing selection of wines starting from £34 a bottle, and going right up to £2,350 – yes you did read that correctly!! We opted for the Sant Veran 2008 Burgundy. A good flavour, and a nice crispness that accompanied the fish really well. As it was a gift, we weren’t privy to the final bill but prices can be found on their website, and be warned that Nobu is not a cheap night out! Amazing produce, amazing food, amazing wine, amazing service… amazing. This buzzy little restaurant sits nestled amongst the various eateries on Wardour Street looking cool, trendy and inviting. We visited on a Friday night and so there were a nice mix of local media types catching a quick bite over some late work, and people dressed up and having a good feed up before hitting the bars and clubs of Soho for a night out. A friendly gentleman greeted us at the door and gave us a choice of where to sit. There are a mix of communal tables and chairs, or a long bar with stalls positioned in the window – great for people watching! He took us through the menu and warned us that although portions looked on the small side, the hummus was actually very filling (which he was absolutely right about!) and so not to order too many sides. Efficient and friendly, the same waiter took care of us for the duration of our stay. The main attraction is of course ‘hummus’. Served deliciously warm and with a silky soft texture, it’s very different to the various hummus dips that we’ve had before. There are a a selection of toppings to choose – everything from slow cooked chunky beef, to a 5,000 year old recipe of fava beans. We opted for the chicken, sautéed in a light tomato based sauce with a side of sundried tomatoes, and the chunky beef. Both were really tasty and felt great on a wintery evening. We also tried sides of the mixed vegetable salad and the falafel salad. The vegetable salad was nice and crunchy with a refreshing parsley and vinegar dressing. The falafel salad had good flavour, but the actual falafel itself was a little on the dry side. We opted to share a dessert, and so tried the Malabi – a milk based dessert served with date honey. This was the star of the show for me, a really light but unusual silky dessert that resembled panacotta, but with a little more bite. Hummus Bros don’t sell alcohol, but they do have a good selection of smoothies, juices and hot drinks such as hot spiced apple juice. We tried the fresh mint and ginger lemonade, which was unfortunately lacking in ginger zing, and a little too much on the sugary side. The overall cost of our meal was £32.60 – a great price considering the quality of the food and the fact that we both left with our bellies resting in our hands! The dessert was the biggest bargain, costing just £2! 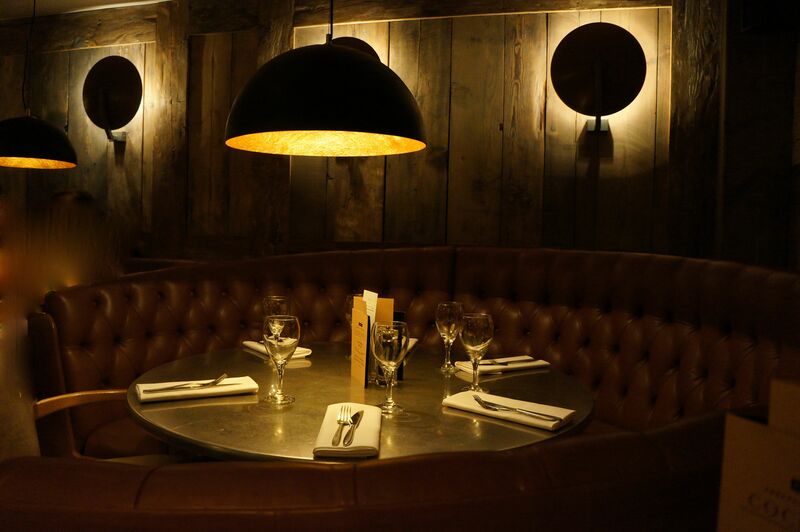 The perfect place for a quick eat before hitting Soho for a night out. Entering the restaurant via the Deli means that you’re immediately transported to the culinary delights of Italy. A nice mix of couples and friends provide a warm buzz. 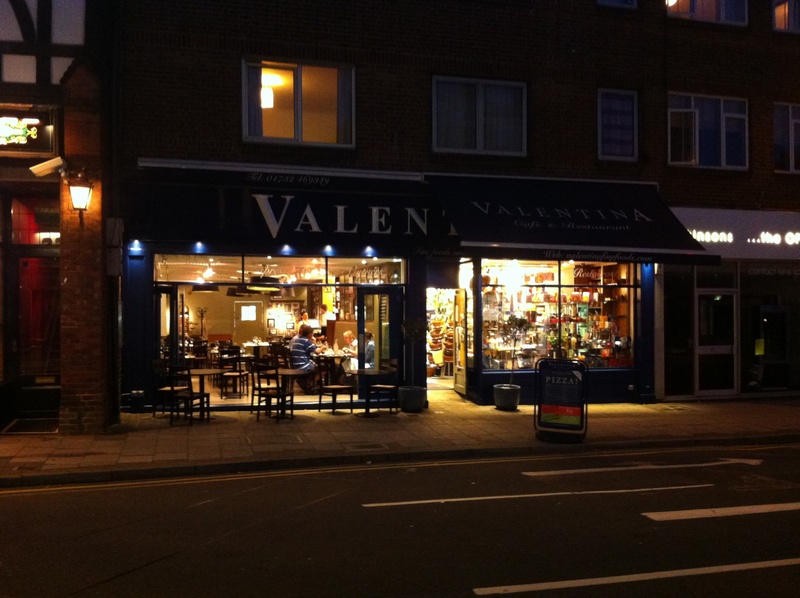 From meeting and greeting, to menu recommendations and tales of where produce comes from, everything about the service at Valentina is smooth, friendly and efficient. You can’t sit in a room next to such a well-stocked deli and not order the Antipasto Primavera. The pizza bases were also sublime and the Capella Romano was packed full of ‘Nonna’s meatballs’, tagliatelle pasta and baked in a dome of speck ham. Give yourself some time to read through the wine menu – with wines from many different regions of Italy, and all at reasonable prices we opted for the Dolcetto D’Alba Villadoria. A rich flavoured, but easy drinking red. 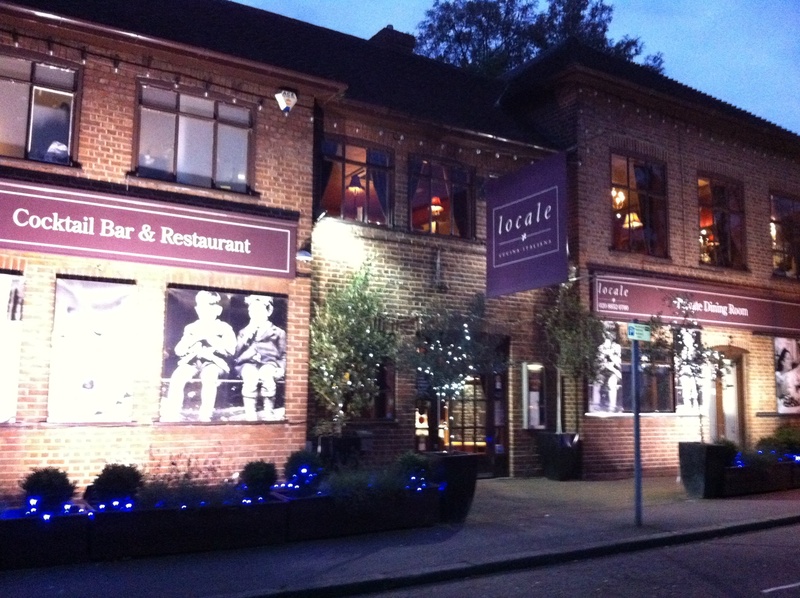 More than just a restaurant – an inspiring Italian slice of heaven in Sevenoaks. We visited on the night of the Grand Maharaja Ball, an annual for ‘friends’ of Tamasha. Full of Bollywood dancers, great bands and Bromley ladies in their finest dresses. There were around 300 guests, and an army of staff to ensure that glasses and plates were never empty. All had time to talk and were friendly, extremely knowledgeable and professional. As this was a special event, drinks were complimentary for all guests, however the wine was chilled perfectly and usually starts from around £15 a bottle with a great selection. Make this your regular Indian restaurant so as not to miss out on next years ball! A very warm welcome, with ladies lunching in the sunshine of the newly renovated garden. Very attentive, with recommendations for dishes on the menu, and a good knowledge of Spanish food. Every dish of tapas was fresh, full of flavour and portion sizes were generous. The octopus is to die for, and the chorizo in wine will keep you going back for more. A good selection of wine, with bottles starting at around £15. I’d recommend going for the house white as it complimented every dish, and suited most palettes in our party. An authentic Spanish restaurant with an extensive menu, and a great garden. A 1920’s style interior with good Italian cooking and imaginative cocktails. Locale could be easily missed by the average visitor to Blackheath because it hides just off of the main High Street in a residential street. We visited on a Tuesday night and the restaurant was still busy and buzzy. Couples, families and colleagues from work sat around the dark wooden tables and listened to the soft background jazz music, whilst sipping on cocktails and enjoying the view from the open kitchen. Unfortunately this was the only weak point for us. Although we could see that our waitress wasn’t representative of the rest of the staff, she seemed to have little knowledge of the menu, forgot to top up our water glasses and when delivering my Mojito, she spilt it down me and the table and didn’t offer to mop it up. The manageress however was extremely knowledgeable and hospitable, and so too were the rest of her staff. With so many delicious dishes to choose from on the Italian menu, I started with the Salumi Misti – a Charcuterie board full of Italian cured meats with shaved fennel, balsamic pickled onions and homemade Focaccia. My partner opted for the zuccini with ricotta cheese – this was a courgette flower, stuffed and deep friend. Deliciously creamy, and a nice start to the meal. For main I chose the sustainably sourced cod fillet wrapped in parma ham and served on a bed of Samphire. All was cooked to perfection, and I ordered a side salad of tomato and onion which accompanied it very well. My partner chose the Linguine ai Frutti di mare – homemade pasta with a good bite and served with cherry tomatoes, clams, mussels, baby calamari, octopus & king prawns sautéed with garlic, chilli, parsley & white wine (we couldn’t find any octopus in the dish, but we let them off because the prawns were so good!) For dessert we shared a panecotta with rhubarb and was told by the manager that the chef likes to change the flavours to reflect the seasons. This one had a slight lemony hint to the rich velvety cream that made it more refreshing than usual. Absolutely delicious. An extensive cocktail menu, that also included after dinner cocktails. We were told that a new addition of ‘Strawberry Cheesecake’ is coming soon and were asked to try it – I’d certainly recommend it if it makes the menu! There is also a good wine list, but unfortunately the glasses of wine that we ordered could have been slightly more chilled. We opted for the Gavi Gavi which had great flavour and accompanied the fish perfectly. After the meal we were offered a pot of Earl Grey, Elderflower, Lemon and honey tea which was really refreshing and ended the meal well. We were told that although there isn’t a huge selection of teas on the menu, if you ask for an infused tea they will recommend and make something special for you, like perhaps basil and thyme. The overall cost of our meal was £65 plus a 12.5% service charge. Although there were some reasonably priced items on the menu, there were also some dishes that cost around £20 so for a group night out to a local restaurant this could become quite expensive. They do however have a room that’s for hire downstairs that can seat up to £30 people and a set menu can be arranged to ensure that you remain within budget. 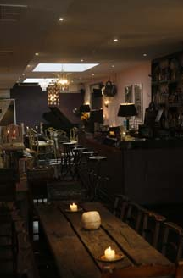 A lovely discovery in Blackheath, with some great Italian food and a good cocktail bar. An interesting fact about Locale: On the first Sunday of every month they hold a Jazz cabaret brunch with burlesque singer Ivy Paige. Authentic Italian cooking, using fresh local ingredients and homemade pasta. Ferrari’s celebrates it 10th birthday in Bromley and continues to delight. A fully booked restaurant with tables of girls dressed up for their Friday night out, and families and couples enjoying the new décor of Ferraris. There was a nice buzz of laughter and a relaxed feel. All waiters seemed very experienced and were extremely attentive without being intrusive. Topping up water jugs throughout the meal, delivering a second spoon so that we could share dessert, and helping to guide us through the food and wine menus. The menu is packed full of authentic Italian dishes with a specials menu at the weekend. I started with the smoked duck slices, thinly cut and served with watermelon and goats cheese – a beautifully fresh and flavoursome combination. My partner opted for the deep fried baby squid served with tartar sauce – the squid was fresh and soft, and the batter light and crispy. For main I had the Linguine Alle Vongole – the pasta made fresh by the restaurant was silky smooth with just the right bite, and the clams were plump and sweet. My partner had the roast roulade of veal, stuffed with smoked mozerella, spinach, sundried tomatoes and served with a red wine sauce and rocket leaves. The smoked mozerella was a little over powering, and it would be advisable to order some sides to go with this dish as the rocket isn’t really enough. For dessert, we shared a sticky date and toffee pudding with vanilla pod ice cream. This wasn’t the highlight of the meal – with the sauce not sticky or thick enough, and the pudding not stodgy enough for a sticky date pudding. A great wine list, with recommended tasting notes next to the wines meant that it was easy to select a wine that would complement our food. We opted for the Sauvignon Il Palu Veneto 2009 which was served perfectly chilled, and was a great accompaniment to all dishes. Also, not a bad price at £17.50 a bottle. The overall cost of our meal was a reasonable £59.10 plus a 12.5% service charge. There were higher priced wines and food on the menu, but two people could enjoy a three course meal with wine for around £65. A nice place to go with friends and family for an authentic Italian meal. Great also for large groups, with the knowledge that you’ll have good food, wine and service. 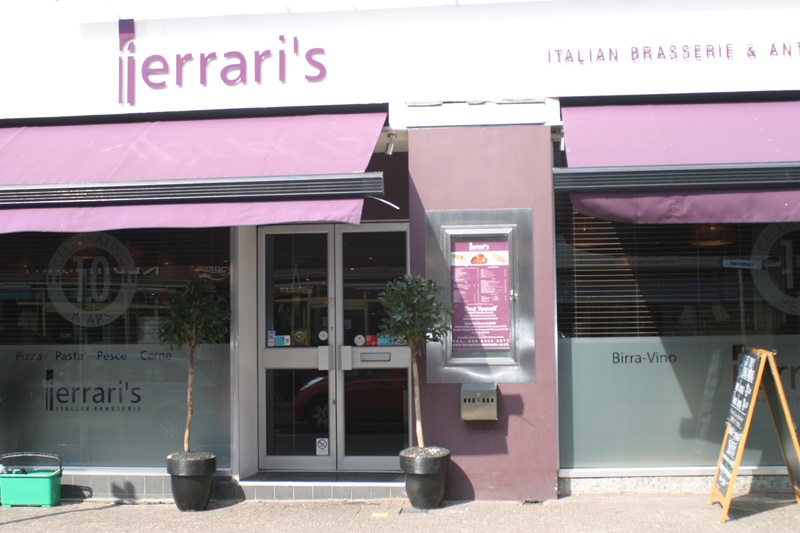 An interesting fact about Ferrari’s: Celebrating its 10th birthday in Bromley, Ferrari’s is now fully licensed for weddings. A gem of a steakhouse can be found in Bromley – with British steaks being cooked in a ‘Josper Oven’ – apparently the hottest indoor barbeque in the world, that gives the steaks a unique charcoal flavour. We visited on a Wednesday night and the restaurant was nicely busy with a mix of couples and families. 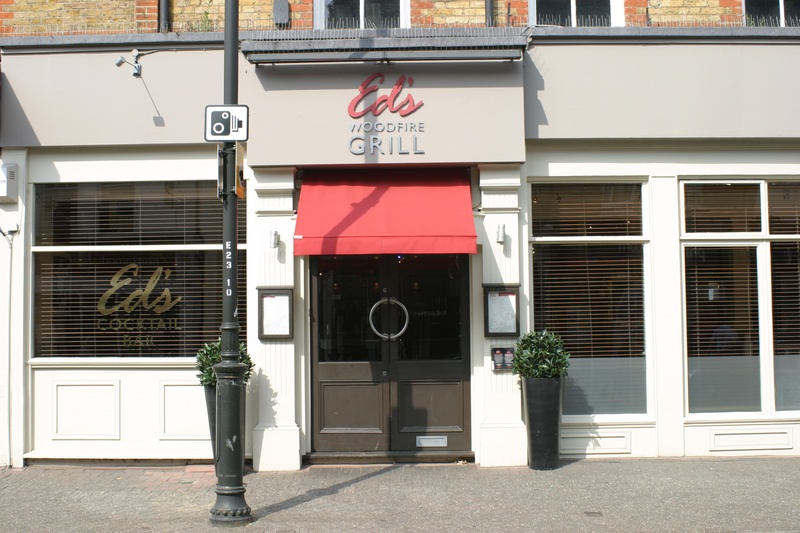 On first glance, you wouldn’t guess that Ed’s is a steakhouse. It doesn’t have the animal skins on the wall like Goucho, and it doesn’t have the typical American diner style that most steakhouses try to portray. Instead it’s a comfortable and laid back restaurant without the fancies of tablecloths or mood lighting. Our waitress was extremely knowledgeable and very enthusiastic as well as friendly and attentive. She helped us around the menu, telling us what the chefs take most pride in (their sides!) and being open and honest about portion sizes (large!). We were given a nice amount of waiting time between courses so that the evening wasn’t rushed, and glasses were topped up and jugs of water replenished throughout. There’s a genius star rating facility on Ed’s website, where customers rate each dish on the menu that they’ve tried. According to this, the Baked brie is the best starter, followed by chargrilled freerange chicken breast and a side of Ed’s signature Mac & Cheese. We decided to go for something different, and so opted for a starter of Maple cured baby rack ribs with celeriac and apple coleslaw. Our waitress advised us that the portion size is rather large, and quite right she was too – so we shared this and it was plenty big enough. The meat literally fell off the bones. For main, we each chose a steak – I opted for the Hanger steak, also known as the ‘Butchers steak’ (so called because butchers would often keep it for themselves). It’s a cut that comes from the diaphragm of the cow so is full of flavour and best cooked quickly over a high heat, served rare or medium. It has one long grisly piece running through the centre, and so you should cut to either side of this for the tender, buttery melt in your mouth meat. My guest had the flat iron steak, which neither of us had tried before but was recommended by the waitress of its lean quality to fully appreciate the Josper oven. It’s a cut that comes from the shoulder of the cow and so has no muscle or fat whatsoever. It melts in the mouth and is now my new favourite steak – even better than a fillet (a bold statement I know!). With our steaks came chips in a rustic looking silver bucket – unfortunately these weren’t the highlight of the meal, we’d have preferred either nice chunky chips or thin fries, but these were kind of in-between with way too much salt. Our sides were buttermilk onion rings and creamed corn with lemon zest as well as some roasted bone marrow to bring out the flavours in the steaks. The onions rings were out of this world – light and fluffy crispy batter and extremely moorish. Stuffed full to the brim, but presented with a tasty looking dessert menu, we decided to share an apple tart tatin with Calvados crème fraiche. Unfortunately the pasty was a little undercooked and so a little on the soft side. The apples and the hot maple sauce were delicious though, and the calvados flavour sang through and complemented them both perfectly. The overall cost of our meal was an extremely reasonable £60.95 plus a 12.5% service charge. The perfect place to go with friends of family for a good steak and a cocktail. The effect of cooking in the Josper oven means that the steaks and marbled with flavour and cooked to perfection. The only advice would be to crisp up the pastry on the tart tartin, chunk up the chips and place a matt underneath the plates so that they don’t slide around whilst customers are cutting in to their steaks with their very impressive steak knives. An interesting fact about Ed’s Woodfire Grill: All prime meats are sourced from British rare bread farmers and long aged. This is what I want! A successful pub/restaurant by the sea where walkers and cyclists can pop in to top up their water bottles, and friends can come to spend their afternoon and evenings enjoying home grown food and homebaked bread with fresh fish and meat from the cattle that graze in the fields by the restaurant. 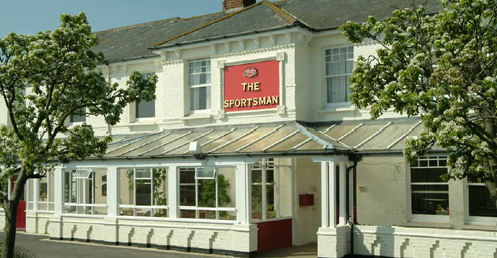 The Sportsman has it all… and that’s why we had to wait for so long to try it, but it was certainly worth the wait! Big pine farmouse tables with comfy chairs and cushions, families and friends chatting away in their walking boots sipping on glasses of Champagne and Prosecco, and friendly staff stood behind the bar and buzzing around with plates of home grown food. The service is very laid back, but with an air of professionalism and knowledge. Everyone knew the menu back to front and with the bar situated centrally to the restaurant, if there was anything that you needed, you only had to ask. The food was heavenly. Don’t be fooled in to reading the menu and thinking that portions might not be big enough! We left feeling absolutely full to the brim, and thankful for the sea walk home. To start, I had poached oysters in a creamy sauce with pickled cucumber and topped with caviar… absolutely stunning. My partner had the pork terrine, served with some homemade toasted bread pickles… delicious. For main I had the Braised Turbot Fillet with a mussel pistou (like a very delicate pesto but minus the pine nuts). My partner opted for the Thornback Ray with brown butter, cockles and sherry vinegar dressing. Both were cooked to perfection, but my turbot had the edge! For dessert we shared a deconstructed rhubarb crumble – a small shot glass of good, sharp rhubarb sorbet, a small cup full of thick creamed vanilla custard topped with a strong burnt sugar crust, and a wedge of biscuit crumble on the side to bring it all together. A nice selection of wines, starting at around £16 for a bottle, or £4.25 for a glass. We opted for the Albarino which was £21.95, perfectly cold and very drinkable. Our meal with wine came to just over £100 – Not a cheap meal, but certainly worth every penny. When compared to fine dining in London, The Sportsman wins hands down. It’s a place of rustic charm, that’s so beautifully situated and each dish has genuine warmth and heart put in to it. Delicious food, a relaxed atmosphere and friendly staff – all situated by the sea and enjoying what they do. What more could ask for? I’d strongly recommend that you make a trip to Seasalter just for the experience of The Sportsman… but remember to book ahead! I’m finding it really hard to write this without breaking out in to rhyming verse, because we were so truly inspired by the poets, food and lovely people at the We Eat Poets evening held at Brunswick House Café last week. An absolute MUST if you’re looking for a slightly quirky night out with an interesting venue, great produce (supplied by Cannon & Cannon) and the chance to meet new friends for an evening. It felt like arriving in a room full of your best friends – everyone was so lovely welcoming, chatty, sharing food stories, talking about the amazing chandeliers, the huge mirrors and other items around the room that were all for sale. Entertainment was great – with poets getting up and sharing their food themed poems with the room between courses, and cheese smelling and tasting competitions… the prize being the chance to provide a word which then gets put in to a poem.. my partner actually guessed all 6 cheese correctly and so offered up the word ‘marriage’, which the poor Edward Mackay then had to turn in to a poem with the other words ‘Constantinople’ and ‘periphery’! The result of which was a great poem that he entitled ‘Where to find a good meal in Vauxhall‘. It summed up the evening superbly. Food was served up on large platters with everyone at the table helping themselves and sharing dishes. This really helped to add to the conversation and had a family/communal feel to it. Very similar to that experienced at Supper Clubs. Waitresses were constantly topping up water jugs, taking drinks orders and clearing away empty plates with smiles on their faces. My goodness, what can I say about the food to actually do it justice? Every dish was bursting with flavour, and I wanted the recipes for all of it!! We started with a plate of cured meats from Canon & Canon, then moved on to Tripe and warm, delicious sour dough focacia then artichokes with peas and Wissington cheese, followed by salt cod with baby gem and garlic tomatoes, followed by a bit of a break for some poetry, then shredded old spot shoulder with lots of gorgeous crackling red onions and capers, a cheese tasting competition (6 different cheeses), semolina dumplings topped with Binham blue walnuts, some dressed watercress to clean the palette, then saffron courgettes peas and mint, then 3 more different cheeses to finish. The majority of amazing produce was supplied by Canon & Canon and cooked by chefs Jackson Boxer and Nick Balfe – amazing talent! You might be fooled into thinking that all of the above was a menu from which we chose a few dishes from, but no… we did actually get to eat ALL of it! So delicious, so inspiring and so well worth the £40 ticket price. A ticket for the evening is £40 and that includes all food, as well as entertainment and a complimentary cocktail upon arrival. Wine was a little on the expensive side, but a great selection and all served at perfect temperatures. I’m a bit bored of writing about how fantastic this evening was now… Just go! The next date is to be announced, but should be some time in October 2011. Join the We Eat Poets mailing list so that you can be notified of when the next event will be, and order your tickets straight away, because I have a feeling that it’s going to be another sell out night. 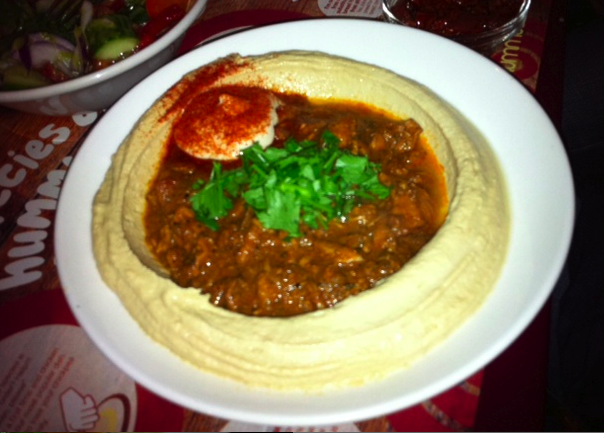 Located in the heart of Soho, on Greek Street – this Moroccan/Lebanese restaurant is celebrating its 25th anniversary. With the buzz of the area and its great sunspot location and doors that open out on to the street, this makes a perfect summer destination for lunch to watch the world go by and eat some good food. Either sit outside for some hustle and bussle if the weather’s good, or sit inside for a more relaxed and quiet atmosphere. We went for lunch at 1pm on a Saturday, and although not overly busy, there were enough people to create a nice feel in the restaurant. I’m sure that in the evenings things heat up inside, with belly dancers and a packed restaurant full of people enjoying birthdays and nights out on the town. A slightly flustered but very friendly waiter welcomed us at the door and took us to our table. We were asked if we’d like to have a wedge put under our table to stop it wobbling – which was very considerate, but then we watched as he circled the rest of the restaurant doing the same for every other table… probably not the best way to welcome guests, and best to do at the beginning of the day before everyone is seated! A very friendly lady came over to take our order, but unfortunately didn’t speak very good English and so when we asked whether the chefs selection of Meze contained any nuts, we didn’t feel too reassured after she just gave a rather blank look and then nodded to say “yes”.. so we went with the safer option of making our own selections from the menu and trusting the nut guide that was clearly displayed as part of the menu. The menu was easy to follow and packed full of delicious dishes. We opted for a selection of 4 different Meze to share as a starter, consisting of Kafta Meshwi (grilled minced lamb marinated with herbs, onions and sumac, served with harrisa sauce), Fatayer (Pastry filled with spinach, onions and lemon juice), Makanek (Spicy sausages served with chopped tomatoes) and Kallaj (Lebanese toasted bread filled with Halloumi cheese). Our favourite was the Kallaj because the bread was so fresh and crispy, and the halloumi warm and soft, with lots of dried mint to cut through the delicious saltiness of the cheese. For main course, I had the lamb tagine which came with cooked apricots, prunes and saltanas. The lamb was so well cooked and succulent, without being overly cooked or stringy and the smell and flavours from the tagine were amazing. My partner had the mixed grill, a selection of chicken, lamb and kafta served with salad and rice. The meat was well cooked and there was plenty of it, but the tagine is definitely the dish to try! We were so full that we couldn’t handle dessert, although we saw fresh Baklawa being carried through the restaurant that looked great. Four meze starters, and two main courses came to £70.80 (not including wine) which is quite expensive for lunch, but then we were a little greedy and could quite happily have been satisfied with just 5 or 6 meze plates to share at that time of day. 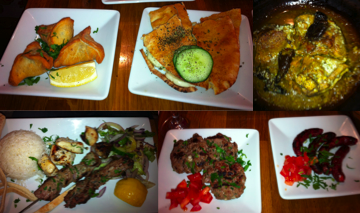 Meze start at £4.75 and go up to £5.95 and main courses start from £12.90 and go up to £21 for the lamb shoulder. There is also a set menu available for just £23.95 per person (minimum of 2 people), which includes 5 cold and hot starters of the chef’s choice, your choice of any main and Baklawa and mint tea for dessert. We opted for the Moroccan dry white wine which was just £15.50 a bottle, and it was really quite drinkable, especially complementing the tagine, offering a refreshing cut through of the richness of the spices. Other wines from Italy, Argentina and Spain were also available, with prices around £20 – £30. The food was faultless at Maison Touareg with real authentic Morrocan and Lebanese flavours, however the service and general feeling of not feeling quite safe in their hands left us with a slightly disappointed feeling. We were there when the restaurant was only a third full, and just two of us dining, and I fear that if that had been a large group on a busy evening, that there was the potential to have a few issues, particularly with language barriers and staff not really communicating with each other to know who was responsible for which tables. That said, it could be a completely different team put on the floor in the evenings, and so please don’t let this put you off of going to Maison Touareg because you MUST go there to try the Kallaj and the lamb tagine.. they are amazing! Situated just over the road from Kentish Town tube station, this all day diner is a destination spot for those wanting to grab some nibbles and a cocktail, for a girlie or business lunch, or for an unpretentious evening meal packed with fresh ingredients and full of flavour. A nice chillaxed vibe, that appeared to be child friendly as well as grown up. We went on a Wednesday night at 8pm and the restaurant was quite busy with tables of friends, couples and (we speculate!) first dates. The menu is packed full of simple but quite healthy and tasty sounding dishes. We opted for the Bruschetta of crushed broad beans, peas & mint with Swaledale goat’s cheese to start, along with a starter sized portion of the Devon crab, lemon and chilli linguine. Both were totally delicious – the Bruschetta was fresh and light and the goats cheese creamy, and the linguine had just the right amount of chilli and plenty of crab. We were also served a small selection of tasters from the salads that are available – the broccoli with anchovy being our favourite. For mains, we had the Butchers cut steak with horseradish cream, watercress and fat chips – the steak was just as Wendy had described.. silky, tender, and cooked to perfection. We also opted for the Scottish lamb rump with crushed new potatoes, purple sprouting broccoli and a rich red wine & rosemary jus. Perhaps a little on the rare side for some, this was absolutely to our liking. The lamb had a delicious flavour, was beautifully tender and the portion sizes for both dishes were perfect – not too small, but also not overly generous so that you could still leave room for dessert. For dessert, we were spoilt for choice – torn between the cheesecakes and the tarts, we opted though for the White Chocolate Creme Brulee, which unfortunately didn’t have the crunch on top that was expected, and the very reasonably priced cheese board – just £6 with three different cheeses, celery, a homemade pear chutney with oat biscuits. For the quality of ingredients, and the standard of cooking, we felt that everything on the menu was reasonably priced. From £3.95 for a soup starter, to £15 for a sharing platter for two. Mains were priced around £10, and moving up to around £15 for the choice cut meats but with sides included, we didn’t feel that this was too unreasonable. Desserts were priced between £4 – £6 and portion sizes were ample. Wine started at £14.95 a bottle, and went up to £33 for a Petit Chablis. We opted for the Monastrell DO Yecla, Bodegas Castaño, Spain, 09 at £19.75 – full bodied and served at just the right temperature. The service and food were faultless, with a nice mix of customers and a good vibe. We couldn’t help feeling though, that that we were in more of a day-time restaurant with dishes being served up very swiftly between courses and people passing through for a quick bite rather than relaxing for an evening meal. Although the Kentish Canteen describes itself as a diner, perhaps some dimmer lights and a little more time between courses would have made this an absolutely perfect evening… and just a little more crunch on the brulee. I would however strongly recommend that you give the Kentish Canteen a try, and definitely start your evening with one of their cocktails! The competition for the best Afternoon Tea in London is hotting up, so we thought we’d try out Charlotte Street Hotels offer of Afternoon tea with sandwiches, homemade scones, macaroons, chocolate cake, cake and more cake. We left absolutely stuffed, and with a goody bag filled with even more of the cakes that we couldn’t eat. 1 O’clock on a Monday after the bank holiday weekend was perfect, because there was a very relaxed and not too overly busy feel to the bar/dining room. We were seated at one of the larger tables and saw Zoe Ball walk in to the hotel reception.. clearly the place to be! The waitress met us at the door with a friendly “Hello” and showed us to our table which had already been laid out with pretty floral Wedgwood cups and saucers and silver strainers. Throughout Tea, were had our pots topped up and were checked on to ensure that we were doing OK and not overdosing on the sweet stuff… which of course we were! The Tea was delicious – fresh finger sandwiches filled with smoked salmon, ham, cheese and Egg mayonnaise, warm scones with clotted cream, jam and fresh berries, chocolate cake, chocolate choux buns, lemon and raspberry tartlets and vibrant macaroons piled high on the tiered cake stand. Quite a reasonable £21.50 per person, considering we had more than one pot of tea each and could only manage two thirds of the food on the tiered stand. 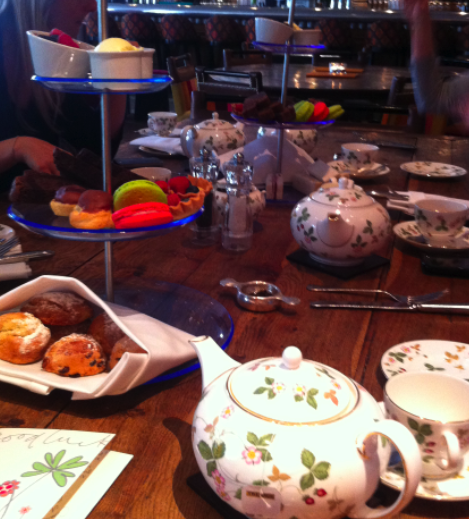 Although this was a delicious selection and in a sophisticated setting, the actual ‘Afternoon Tea’ experience wasn’t as amazing as some of the other venues around London, which provide a real sense of ‘special occasion’. I’m sure that if we’d have opted for the Ruinart and Miller Harris Sensory Tea at £35 per person, this probably would have been slightly different, but I would still highly recommend it as a great place to go with work mates or clients… just not necessarily with your ‘special girlies’ at the weekend! In sleepy Hayes Village (Hayes Street, Kent), there has been a bit of foodie uprising going on… first The George pub opened, just a few doors up from the Farm shop, serving delicious posh-pub grub, and now a new addition, ‘Cut The Mustard’ has opened a few doors up from Dillingers (serving great ribs and steaks). Cut the Mustard is a cross between a family friendly cafe and a homely restaurant, serving organic and free range products, the husband and wife owners first venture in to the foodie industry seems to be a blooming success. We went along at 9am on a Saturday morning and sat outside in the sunshine with our dog, Jack. Customers were just starting to arrive for their breakfast, and the outside seats are in a little sun spot – lovely! We were greeted with a warm smile and a welcome by the owners, and offered a menu to peruse whilst our tea was made and delivered to our table – great first impressions, and the service continued throughout our visit. A traditionally British menu with everything from all day breakfasts to Shepherds pie and cakes made by locals. All local produce, organic eggs, Sausages from Kent and home made sausage rolls and pasties. As we were there so early, we just opted for a mug of tea each and a sausage sandwich. Sausages were tasty, and served in thick crusty white doorstep bread with a choice of sauces and a small side salad. Very tasty, and not too overly priced at £3.20 for a sausage sandwich and a mug of tea. Average breakfast prices were around 6.50 which is a little on the expensive side, but I suppose you get what you pay for! No license unfortunately – but I’m wondering whether, if they extend their opening times in to the evening, and they get to serve the dinner crowds, whether they might consider operating a ‘bring your own’??! please please PLEASE!! 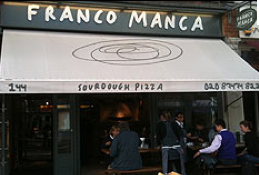 Franco Manca is a pizzeria with restaurants in Brixton, and now Chiswick. Their unique sourdough based pizzas are baked in a mosaic-tiled, wood burning ‘Tufae’ brick oven built on site by special artisans from Naples, giving them a moorishly smooth and chewy texture. The queues outside the restaurant on a Saturday night showed just how popular this new addition to Chiswick’s High Street is, but what was our final verdict on the experience? We visited Franco Manca on a Saturday night at 7pm, just as the queue was starting to build at the door. It was packed full of customers, with a good vibe and staff were bustling around, taking orders and tending to the wave of hands for more drinks. A great place to go before a night out, or to gather with a large group of friends. Tables were quite close together and had an informal feel with hooks on the wall to hang coats, and tins of cutlery and paper napkins. We were shown to our table with a warm Italian welcome, and taken through the menu. Unfortunately we later found that there was a specials board, but hadn’t been shown it, so missed out on this. A couple of the dishes and wines that we ordered were no longer available on the menu, due to the smaller independent suppliers that are used by the restaurant, however the waiter quickly explained this to us, and recommended some alternatives. On the main menu, there was a choice of six pizzas and six different types of ‘bites’ as starters, from a meat and cheese platter with wild boar mortadella and Gloucester old spot home cured ham, to baked aubergine with mozerella. We opted for the meat and cheese platter to share with millstone cheese, and some flame baked bread topped with wild artichoke stem, buffalo mozzarella, rocket and sundried tomato. Both were really tasty with great fresh produce and the platter was of a decent size for two to share. For the mains, we opted for the home cured Gloucester old spot ham (which had a slight turkey taste and texture to it), mozzerella, buffalo ricotta and wild mushroom pizza, and the tomato, garlic, oregano, capers, olivers, anchovies and mozerella pizza. The bases were certainly moorish in texture, and had a nice taste to them, but unfortunately accompanied with the toppings, the Gloucester pizza became a little too rich and creamy with the style of the base and the ricotta and mozerella on it, and the second pizza with the anchovies, capers and olives just tasted so overly salty that we had to swap half way through each of the pizzas to be able to finish them. Around half an hour after leaving we were so thirsty that we had to down pints of water! It was such a shame that we hadn’t been shown the specials boards because perhaps with a different type of topping we could have appreciated the sourdough base a little more. For dessert, we were so full and thirsty that we chose to share a single scoop of the grape sorbet. That was lovely and refreshing, but one scoop in the bottom of a rather large glass just didn’t make it look very special. Pizzas start from an extremely reasonable £4.50 and go up to £6.95. Starters range from £1.95 for olives, to £5.95 for the meat and cheese platter. A really reasonably priced menu, especially considering the restaurants expensive location and the quality of the produce sourced. We originally ordered the organic Ottavio white wine at £12.95 a bottle, but they had unfortunately sold out, so the waiter suggested we try the organic Madregale white (still just £12.95 a bottle). It was a really refreshing, zingy white with lots of flavour, and an almost slightly sparkly edge to it. It complemented the pizza’s soughdough base well as it helped to cleanse the palette between bites. Unfortunately our expectations of the soughdough base had been raised so high (no pun intended!) before we arrived, that when we got to try it, although the texture was different to what we’d tried before, it still didn’t live up to the ultra thin crispyness of a pizza base that you’d get in other parts of Italy. The toppings we also felt let down the main course, mainly due to the overly saltyness of the anchovies, capers and olives. Service was however great, and the atmosphere was brilliant for a Saturday night. I’m sure that the huge queue as we left the restaurant is also a good indication that this is a well-liked and enjoyed addition to Chiswick High Street that will be around for quite some time, but unfortunately for us this just wasn’t on the top of the list of one of the best places we’d ever eaten pizza. Don’t just take our opinion for it though, give Franco Manca a try – and make sure you look out for the specials board! I struggled when writing this, firstly because I didn’t know whether to file it under ‘reviews’ or ‘foodie inspiration’ on the site, because really it fits under both – and secondly because I don’t want so many people to find out about this concept that it becomes mainstream and looses its charm and excitement. I can’t tell you how inspired and excited I felt when I left Fernandez and Leluu’Supper Club. It has opened up a whole new culinary world to me, and I’m actually now struggling to wonder whether I’ll ever enjoy eating out at a traditional restaurant again! The food was Michelin star quality, with a menu designed by Simon Fernandez, and prepared by Fernandez with the assistance of two chefs from Fifteen – beautifully presented, amazingly fresh, well cooked and the atmosphere and concept was mind blowing. Thanks to Trusted Places from Yell.com for letting me attend this event, who’s ultimate goal was to help raise money for the Jamie Oliver Foundation. Before I continue with the review, let me first explain to those of you, who like me had never been to a Supper Club before, or don’t know what the concept of it is. It’s an underground scene, where people (who tend to be great at rustling up restaurant quality food) open their house to strangers for the evening, normally transforming their living room and dining room in to a restaurant. It started in Latin America, and the traditional style was one large table with everyone seated together and sharing platters of food, the general idea being that you sit with people you don’t know. This is still present in most UK Supper Clubs today. but seating arrangements are obviously dependent on the size and shape of the house that it’s being hosted in. For some Supper Clubs, you pay at the end of the meal what you think it was worth, and for others they will specify a price before you arrive (normally between £20 – £40) enable you to book online, and tell you to bring along your own alcohol. If you like the sound of the Supper Club concept, then here are a few websites that I’ve come across in my research that look useful. I also strongly suggest that you give Fernandez and Leluu a go first! I can guarantee that you won’t be disappointed. Thank you Fernandez and Leluu, for opening your home to us. and for introducing me to a whole new world of exciting culinary delights. Hopefully one day I’ll have the confidence to open my open Supper Club and return the favour! 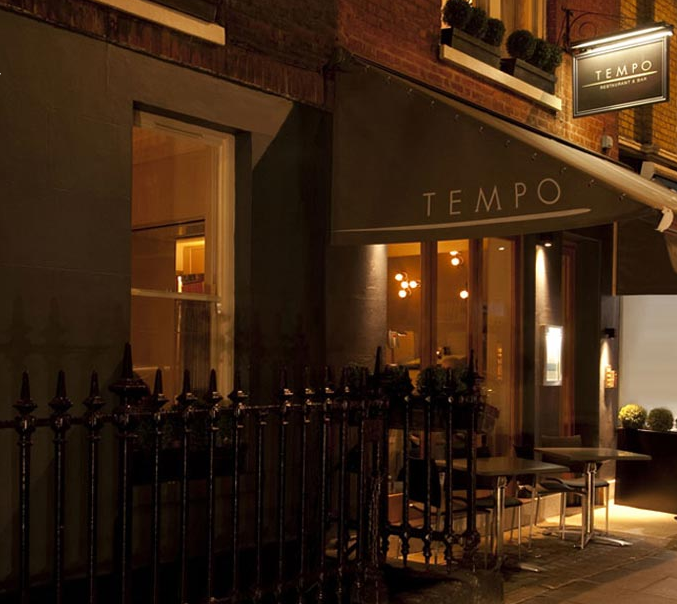 Tempo, owned by enterprising hotelier Henry Togna is situated on Curzon Street in the heart of Mayfair. A warm light glowed from the large windows in both the downstairs restaurant and sophisticated upstairs bar, befitting of the same welcome that we received from the staff. The food – authentic Italian, is created by Japanese chef, Yoshi Yamada (formerly the chef of St Alban). The presence of some amazingly fresh carpaccio dishes and Zucchine fritte on the menu are the only tell tale signs of Yoshi’s origin, whilst the rest of the menu is traditionally Italian. We dined on a Thursday night, at 8pm, but arrived half an hour before to have a cocktail in the very relaxing and intimate bar. A Mojito with a good kick and zing, and a Gin (from Clapham!) and Tonic helped to shake the working day from our shoulders and prepared us for our meal. The bar wasn’t overly busy, but all seats were taken and there was a nice home from home feel about it, with some chilled Ibiza style music playing in the background. The service was attentive and friendly. Our coats and bags were taken when entering the bar, and drinks were made in record time. As we were shown to our table in the restaurant, a bowl of assorted breads were presented to us with a dish of good quality olive oil for dipping. The food was consistently good, and the fresh quality fish served in the carpaccio set the standard for the quality of produce throughout the meal. Sauces were amazing, and everything was beautifully presented. To start, we shared a plate of swordfish carpaccio, which came with a drizzle of olive oil, lemon juice and small capers and black olives, which helped to enhance the flavour of the fish. The Swordfish was so fresh and light, but with a meaty texture – we could have had three courses of it! I then had the razor clams and mussels with Berlotti beans in a garlicky light broth and my partner had the braised baby octopus, fregola which was tender and tasty, with a rich garlic tomato sauce. Both were well presented, and of good sized portions. For main, the waiter recommended that I try the lamb shank with polenta, cavolo nero (and I wasn’t disappointed!) and my partner had the fish stew with prawns, mussels and clams. Again, a beautifully rich and flavoursome dish with good size portions and a side order of the Zucchine fritte was moreish with a light and crispy batter (apparently made with sparkling San Pellegrino!). By the time the dessert menu arrived we were both full to exploding, but we couldn’t resist sharing the lemon tart, and a glass of ice cold limoncello. The tart was refreshingly sharp with a delicate light pastry, and a topping that had the satisfying crunch of a creme brule. A lovely end to a fantastic meal. Around £130 (including wine and liqueurs) for two was quite a reasonable price for the standard of food, service and the restaurants location. We ordered our food and then asked the waiter which wine he would recommend. He suggested the Gavi de Gavi, which at £36 a bottle wasn’t too bad for Mayfair prices. Wines started at a very reasonable £18 and went up to £120, so a great selection and not all wines were from Italy, there were also French and Spanish wines available. The food, location and service was faultless. From the moment we arrived, we felt relaxed and taken care of. I’d certainly recommend Tempo as a place to go with friends, work colleagues or even for a cocktail and a good book on your own after work! It felt more like we were being welcomed into Henry’s home than it did walking into a new restaurant for the first time, and I think that the more popular it becomes, the harder it will be to get a table – so go while you can! Since its opening in 2006, I’ve wanted to try Arbutus. All I ever hear is praise for the food and the service, so expectations were high. Unfortunately I wasn’t blown away, but it certainly wasn’t a bad experience either. We dined on a Wednesday night, at 6.45pm so that we could try out the very reasonably sounding priced pre-theatre menu of 3 courses for £18.95. The restaurant was almost full, but somehow seemed to lack atmosphere. We couldn’t quite put our finger on it – perhaps some soft background music may have helped? Although there were more than enough people, there just wasn’t the usual buzzy Soho restaurant chatter. The service was warm, friendly and without fault. 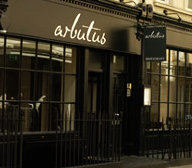 We were asked if it was our first time to the restaurant and welcomed, given wine recommendations and generally made to feel that we were new friends of Arbutus. The food was full of flavour, but unfortunately portion sizes were extremely small. I almost opted for cheese instead of a sweet dessertuntil I saw a person on the table next to be get handed a plate with literally two very small thinly sliced squares of cheese and offered a slice of bread from the basket! From the set menu I had the smoked eel terrine to start, which was packed full of flavour and of a substantial portion. Unfortunately the main course wasn’t as substantial, consisting of slow roast fillet beef, a mouthful of spinach, and half of a small parnsip. Dessert was a very small slice of custard tart, which tasted amazing but could definitely have done with being twice the size. The person I was with went for the vegetarian option. Celeriac soup to start, which he said was very tasty, and for main he had the butternut squash risotto. This came served in a small saute pan, and was smothered in Parmesan. Once again, the portion control wasn’t great! For dessert he too had the custard tart as he’d also seen the size of the cheese portion! £18.95 for a 3 course pre-theatre menu wasn’t bad, considering the normal average price for a main course is £15-£20. Wine can be ordered by the glass, the bottle of the carafe. We had a nice Sauvignon Blanc at £19 for the bottle. After recently competing against Fino for ‘Ramsays Best Restaurant’ El Pirata Detapas has been heaving. Located between Notting Hill and Bayswater, this restaurant runs like clockwork and produces the finest of modern Spanish cuisine. We dined on a Monday night and the restaurant was fully booked and buzzing. We were greeted with a warm welcome at the door, and given an option of which table we would like. The restaurant is tastefully modern and downstairs, there are full hams hanging infront of a moodily lit tiled wall. A really nice comfortable restaurant that also gave a feeling of dining somewhere special. The service was impeccable. The menu was explained with recommendations made, and our glasses were filled throughout the evening. Every member of staff had a smile and genuinely seemed passionate about the food and their service. When we requested that nuts be removed from certain dishes it was no hastle, and alternative recommendations were made. The food was original and stunning. It was recommended that we try the Chefs tasting menu in order to gain a feel for the different style that El Pirata Detapas has to offer. We were not disappointed. First came bread with Aioli – an instant garlic hit to make you think of Spain! this was accompanied by Endives and Valdeon cheese foam. We’d never tried anything like this before. It literally melted in your mouth and was both rich and refreshing at the same time – an absolute must try! This was also served with octopus carpaccio, mandarin caviar & paprika. Again, refreshing, light and full of flavour. Our second course consisted of three more dishes – seared scallops with artichokes heart & iberian bacon (of which the scallops were very fresh and cooked to perfection), black rice and squid with black alioli – full of rich flavours and amazing texture, and pan fried cod, braised savoy cabbage & jus – again, the freshest of fish and amazingly light and well cooked. The third course followed shortly with pigeon breasts in a rich delicious sauce, pork cheeks, carrot puree and red wine shallots (apparently a favourite of most guests and amazingly tender) and serano croquettes that were creamy, crunchy and packed with flavour. For dessert one of us had the chocolate trufa, chocolate mousse & saffron toffee which was rich, silky and every chocoholics dream, and the other had crema catalana two textures – which although tasted gorgeous and had a generous portion, wasn’t favoured as much as the original crema catalana. For the chefs taster menu the full price is just £25 per person. Amazingly cheap considering the amount and quality of food that was presented. The house wine was around £14 and we had a bottle of the Tempranillo – served at a perfect temperature and a great accompaniment to the dishes we were served. A expected, the selection of Spanish wines was some of the finest ranging from around £14 a bottle to £54 a bottle. Situated between China Town and Leicester Square, this trendy looking Sushi restaurant has a great welcoming buzzy atmosphere. A perfect place for a Friday night out with friends and good food. The fish was superbly fresh and the service impeccable. Not a huge restaurant, but enough tables to create a great atmosphere. All tables and chairs are built in to the floor so when being served the waiters and waitresses have to kneel in traditional Japanese style to serve. A nice touch, but we felt sorry for their poor knees by the end of our rather extensive meal! The service was brilliant. A warm welcome and tap water offered as soon as we were seated. After we had spent some time with the rather extensive menu, the waiter kindly made some suggestions as we felt a little overwhelmed by the amount of dishes that were available. He also kindly explained what some items were, and when dishes were served we were taken through suggestions on how to eat them and different sauces to try things with. Fresh and beautifully presented. We started with the Dream team Sushi & sashimi platter, seared tuna and pork dumplings. All were absolutely delicious, and the fish was so light and fresh. For mains we had the blackened cod (amazing! ), eel fried rice (also amazing!) and the Ga Ga special sushi with rice and soup – very nice, again really fresh but unfortunately because we’d had a similar starter, the raw fish became a little too much by the time we were half way through. i’d strongly advise opting for either a cold starter with warm main, or vice versa. For dessert we had ice cream which was wrapped in a rice type jelly/paste and served with different fruit sauces – mango and strawberry. I can’t stress how different, refreshing and absolutely delicious this dessert was – I want to go back just for this! Prices appeared quite reasonable upon first glance, however if you order lots of different smaller dishes, the prices can add up. Starters, or ‘small eats’ ranged from £3 to £5.50 and mains were between £7.50 for salted grilled mackerel and £17 for blackened cod. A nice selection of wine, and the white was served well chilled. We opted for a bottle at around £16. A really great evening with excellent service and food. If you’re not familiar with Japanese food then please don’t let the extensive menu put you off, or think that it’s just about raw fish and cold rice. There are so many sophisticated hot dishes to choose from that are all well prepared, full of flavour and beautifully presented. This newly opened modern Chinese restaurant is only the second restaurant to receive a 5 out of 5 from What I Ate Last Night. From the moment we entered the restaurant we felt welcomed and looked after. The food was amazingly fresh and cooked to perfection, and if you’re in need of a little entertainment, the downstairs bar and restaurant has a top of the range karaoke system – what more could a girl want?! A very stylish restaurant but with a welcoming warmth. The décor is light and airey, and the staff extremely well presented. The restaurant wasn’t full when we visited, but there was enough of a buzz that we felt relaxed and uninterupted. The service was super efficient. As soon as we were seated, the waitress asked if we’d like a drink and returned swiftly with our gin and tonic and the food menu. The smile and enthusiasm that spread across her face when we asked for suggestions on the menu was heart-felt, and throughout the whole evening our glasses were topped up on time, plates swiftly delivered and removed, and between courses we were asked whether we’d like to move on to the next dish, or have a breather – a welcome option once we were in to the third course! Amazing. We started with the dim-sum platter and sweet corn and crab soup – the soup was really refreshing and a great way to cleanse the palette after each of the Dim Sum pieces. All were freshly made by the chefs on-site, and were filled with deliciously fresh spinach and prawns. Dim Sum. We then moved on to every ones favourite – crispy duck with pancakes. The duck was succulent on the inside and beautifully crisp on the outside. All dishes were beautifully presented, and portion sizes were more than generous. For our main course we shared a lobster, served with green rice. The lobster was still warm and floppy in its shell and so we could tell that it had just been taken from the pot. The sauces were amazing, and with the lobster came their award-winning dish of sticky ribs in an espresso and chocolate sauce. Surprisingly lighter in taste than a usual BBQ sauce that you’d expect, and just as Moorish. For dessert, we opted for the mango sorbet – again freshly made in the restaurant, and with nice chunks of fresh mango, it was a perfect finish to the meal. Prices were extremely reasonable for the quality of food, location and service. Starters began at around £2.20 for Dim Sum, and mains around £9. Or you could opt for a set menu with different price levels starting at around £15. A really nice selection of wines from around the world. We opted for a meaty tasting Cabernet that was served at a perfect temperature and topped up throughout the evening. A really lovely evening with fresh, exciting food, a warm welcome environment, and a feeling of passion and dedication from the staff. I would certainly suggest tha you either take clients here to impress and have business lunches or dinners. Once a Turkish baths, this impressive and hidden venue hosts a great restaurant with entertainment, cocktails and a bar… what more could you ask for?! Walking down the tiled stairs to the bar and restaurant, there’s a feeling that you’ve discovered a secret place that’s hidden in the heart of London – and you have. Candlelight and soft music welcomed us, with a full and buzzing restaurant. Later in the evening a fire performing ballet dancer dressed in Burlesque attire weaved between the tables to Disney type music, and then a live guitarist performed Balearic chill-out music. A great atmosphere for either an intimate celebratory meal with friends, or a work function to impress clients who like something a little quirky. Although friendly and informative, there were only two members of staff serving when we visited, and the restaurant was full, so as hard as they tried, they could have done with another pair of hands. We had to wait a while before we got sight of the drinks menu, and unfortunately our mains arrived before our starters, but this was quickly rectified and as the tables began to empty a little, the service became attentive as you’d expect. Food was seasonal and of good quality. Unfortunately both the starters and mains could have been a little warmer, but we assume that was to do with the waiters being rushed off of their feet. Whilst looking over the menu we were served an amuse bouche of red pepper Gaspachio and pesto – very nice indeed! To start we had the crab cakes and then deep fried Camembert – both were nice and crispy on the outside, and accompanied by fresh side salads. For mains we had the Rib Eye steak with Chimichuri sauce and thin fries, and the Lamb chops with cous cous and roasted onion. Again, both great quality produce with delicious flavours and well presented, but unfortunately not piping hot. Dessert was a mouthwateringly delicious chocolate pot with rosemary flavoured homemade shortbread. Starters all sat around the £6 mark, and mains ranged from a very reasonable £10 – £20 including sides. Desserts were just £5 each, and portions for all dishes were of a substantial size. The wine list was delivered inside an Encyclopedia – a really nice touch, and packed full of great sounding wines. We opted for a Spanish Rioja that was priced at £29, but the house Merlot began at a very reasonable £15. 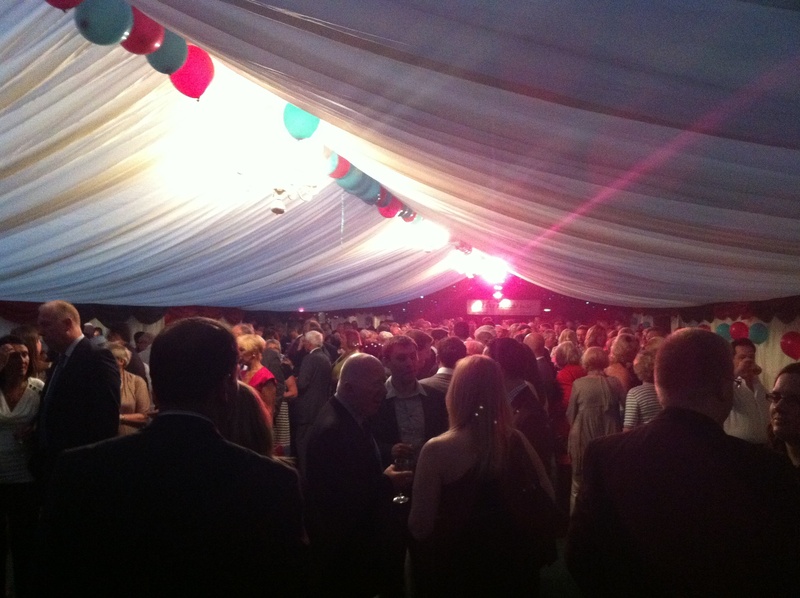 A really great venue with entertainment provided alongside reasonably priced and high quality produce. I’d certainly recommend that you pay this venue a visit for a quirky evening with a difference. As the restaurant has only recently been opened, I’m sure that over the next few weeks, the owners will get used to receiving a full restaurant and add to their waiting staff to bring this up to a 5 out of 5. I just wish it hadn’t have been a school night so that we could have stayed and partied until the early hours of the morning! 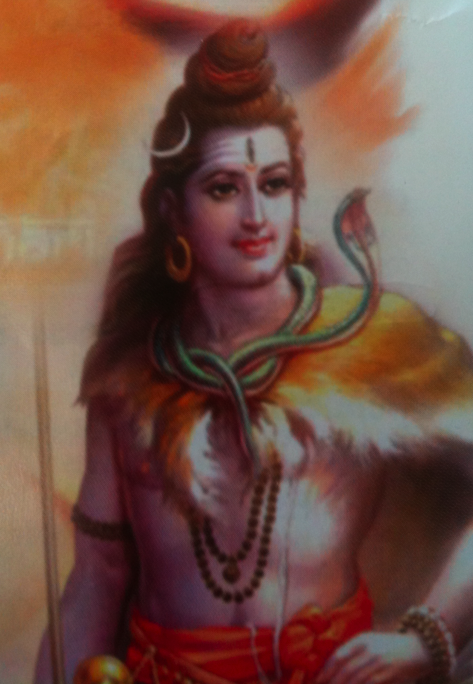 They say never judge a book by its cover, and this is true in the case of Tandav. Nestled between kebab shops and burger bars, this gem of a restaurant serves the best in Indian cuisine with North meets South culinary excellence. If you live in the local area you’re lucky – don’t miss out, make sure you visit. You’ll get to try dishes that you’ve never seen before on an Indian restaurant menu, and you’ll leave with a very full belly! We visited on a Saturday evening at 7.30pm – unfortunately there weren’t many other diners, but the restaurant has only been open for just over a month and so I’m sure the numbers will pick up. Some nice music was playing in the background, and so although it wasn’t busy, we didn’t feel as though everyone was listening in on our conversations. We couldn’t have asked for a friendlier waiter. He helped take us through the menu, recommended sides to accompany our dishes, and had a permanent smile. Nothing was too much trouble, and he kept checking back on us to ensure we had everything we needed. Food was fresh, unique, extremely tasty and well presented. I would suggest however that perhaps some type of chilli system is added to the menu in order to inform diners to the heat levels of the dishes. I had the chilli paneer and although it was absolutely gorgeous, it was a little too spicy for my delicate mouth. Other tried dishes were Poori Masala – a south Indian puffed bread made of wheat flour and served with a lightly spiced potato masala, Masala Dosa – a paper-thin crispy pancake made from rice and lentil, and filled with many different options from potato to prawn, lamb or chicken. We also tried the Kerala chicken curry – succulent pieces of chicken, coated in pepper masala, garlic, mustard seeds, curry leaves and ginger. Sides were Beetroot Thoran and Green Banana. All portion sizes were more than generous and at the end of the meal our friendly waiter asked if we’d like our leftovers packaged up to take home. Starters ranged from a very reasonable £2.50 for Bhaji’s and Samosas, to £5 for meat kebabs. For the main courses, prices ranged from £5 to £10 with sides of around £3. There didn’t appear to be any desserts, but there was no way we could fit one in after the very generous portions from the starters and mains anyway! The house wine was a Malbec, starting at around £11, and prices moved up from there. A nice selection, and fairly reasonable prices. We had a glass of red wine, the Tiger beer and a Passion fruit juice. All served at appropriate temperatures and all very nice. A pleasant suprise, and a very different experience of Indian cuisine. We loved the food and the service, but unfortunately it just seemed to be situated at the wrong end of town. I sincerely hope that the locals recognise this restaurant for the quality food and service that it has to provide, rather than just for a curry and a beer after a night out in the pub. We first visited Leong’s Legends in China Town after seeing it feature on Gordon Ramsays F Word. We were impressed with the freshness of the food and the amazing dim sum then, and were even more impressed when we visited the newly opened Bayswater venue on Queensway. The difference in venues was apparent when we arrived at Bayswater and didn’t have to knock on the door to enter! A warm decor and welcoming smile greeted us and showed us over to our table. The Taiwanese menu was very similar to that at the China Town restaurant, but with a few additions such as duck tongue and thousand year egg. We opted for a slightly less adventurous but very tasty pork and prawn dim sum, meatball and seared beef with crispy garlic. We visited on a Sunday lunch time and the although the restaurant wasn’t full, there were enough people to create a buzz and good atmosphere. Service was prompt, and their ordering style a little different. You are presented with a menu, and a piece of paper and a pen whereby you then tick off the dishes and drinks that you require. In a couple of instances we couldn’t find the dishes that were featured in the menu, however the waitress then wrote them down on our order and swiftly took it away to the kitchen. It was then returned and as the dishes arrived, the waitress ticked off what had been served. Food was fresh, well prepared and well presented. The pork and prawn dim sum dish arrived with 4 pieces, the meatball was one very large ball filled with mushrooms and meat, and was probably our favourite dish of the meal. The beef was extremely tender and full of flavour, and the sticky rice with shredded pork was delicious. We also ordered the special rice with seafood, and although the seafood was very fresh and there was plenty of it, the rice was a little bland and we could have done with some type of sauces or a soy sauce on the table to help jazz it up a little. For dessert, we shared a mango jelly which was really refreshing, and a pleasant end to a very large meal. Prices ranged from £3 to £12 with portions huge! great value for money, and don’t get carried away with ordering too many things. Treat the dishes as you would tapas, ordering a couple of dishes to start and then a couple more if you’re still hungry. We didn’t order any wine as the fruit juices looked too nice! We had a lychee juice and a fresh orange juice. Both costing around £3. A really nice restaurant for afternoon lunch, and the Bayswater location makes it perfect for a Sunday. We opted for a swim in the serpentine before our meal and then a stroll along the Bayswater road after to view the paintings of local artists. My reason for only giving 3.5 out of 5 is due to the fact that although food was outstanding, and service good, it’s not the kind of restaurant that you could spend an evening in chilling with a bottle of wine and feeling relaxed. That being said, I would strongly recommend that you give it a try, and think that you’ll experience the best dim sum you’ll ever taste! 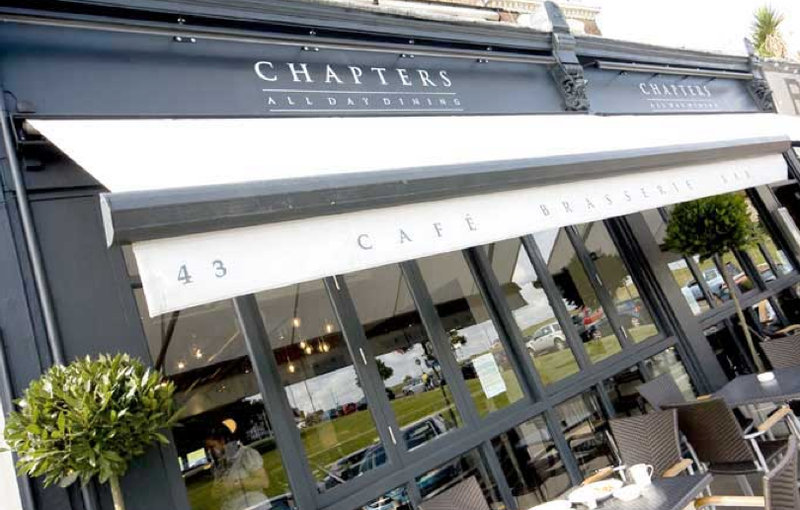 This is a newly opened restaurant in Whitstable and owned by the same people as Windy Stores – described by the Kent on Sunday as being at ‘the wrong end’ of Whitstable – i.e. it’s not by the beach and next to The Oyster or the Fish Harbour, but instead closer to the Sea Salter end of the high street. We drove up and down 3 times before we noticed it, so keep a beady eye out as you walk along! 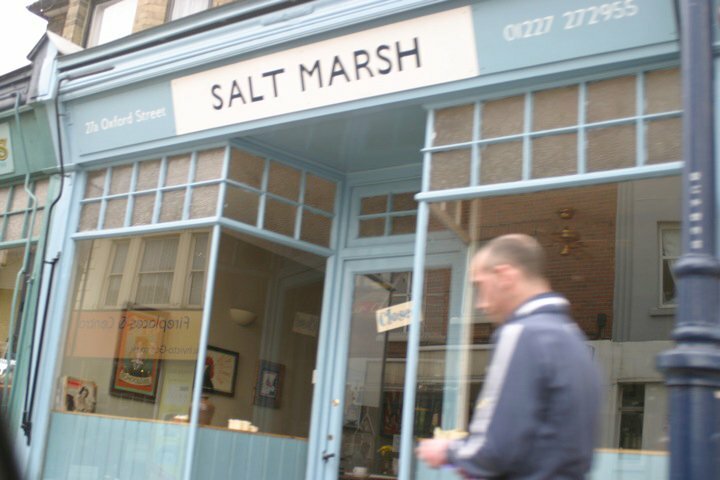 It’s such a lovely new addition to the restaurant scene of Whitstable. Don’t expect elaborate and expensive menus – but do expect to have to book in advance! 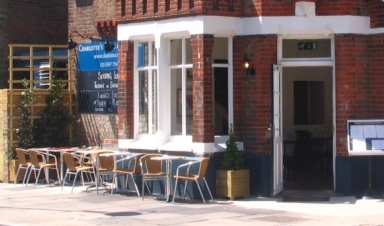 their ethos is great home cooked food with large portions, and in a comfortable friendly atmosphere. Wooden tables with miss-matched chairs, a small garden area with the chimmery burning, and motown and soul playing on the record player (YES, record player!!). You book a table, turn up and they’ll tell you what they’re cooking that day. You won’t see any prices until you receive your bill – but don’t worry, it’s very reasonable! and the service is great. Top notch. Drinks were topped up, food arrived swiftly, and we were greeted with a smile. It felt almost as if the waitress were a friend that we’d known for years who’d invited us over for lunch! I called on the Sunday morning to make a reservation for lunch, and said that we’d like a table for around 3pm. The waitress said they’d be happy to hold us a dinner, as they normally ‘run out’ around 2! when we arrived, she remembered my name from the call, asked where we’d like to sit and swiftly arrived with our drinks. At the end of the meal we hadn’t been charged for two of the glasses of wine, and when we alerted her to the fact she said “well in that case, they’re on the house!” – we left a generous tip to cover them!! Obviously a little strange to order without seeing any prices, but refreshingly pleasant when the bill arrived and we only paid £11 each for two drinks and a HUGE Sunday roast! absolutely worth every penny. Amazing. We both ordered roast lamb and it arrived on a very large plate each full of just the meat and extra crispy large tasty roast potatoes and parsnips. Then came the bowl with carrots, green beans and brocolli, then came the bowl of red cabbage with apple, then came the bowl of cauliflower cheese! Thank goodness we’d had a very long sea walk before otherwise we’d have never got through it! everything so absolutely delicious and the meat so tender, that we cleaned out plates. Offered dessert, we couldn’t touch another thing though! A homely, comfortable and chilled local restaurant with the most friendliest and knowledgeable staff that I’ve met in a long time. Great cocktails, great food, great service. I’d travel to eat here again and strongly recommend that you try it. Particularly if you’ve had a hard day at work and want somewhere to lift your spirits. 5 star! The very friendly and knowledgeable barman was on hand to make whatever we wanted (unless you want cheap mixers or vodka – they don’t do that here!) Once we’d finished our gin mojitos and were shown to our table, the waiter took over, and walked us through the seasonal and tasty looking menu. Once we’d decided upon our dishes, the wine menu arrived, along with a nice large jug of cold tap water and an amuse bouche that got our taste buds going. Our glasses were filled throughout the meal, and we wanted for nothing. For starters we ordered the Jerusalem artichoke soup with ickle watercress and pumpkin seeds, and the duck terrine with roasted beetroot and beetroot leaf pesto. Both were generous sized portions and tasted absolutely gorgeous. No scrimping on the duck here! For mains we ordered the pork wrapped in pancetta and then brill with venison stew. The pork was succulent and full of flavour. The brill was perfectly cooked, but unfortunately the venison that accompanied it was very dry, and although the flavours on their own were lovely, it did feel as though there were two very different dinners served on one plate. We were so full by the time the dessert menu arrived, but after seeing the smile on other diners faces. we couldn’t say no, and so shared the chocolate mouse. It was very well presented, and tasted rich but light with a slight hint of espresso, mint and strawberries. A definite must if you visit! A nice wine selection, we opted for the Chilean white but they’d unfortunately sold out, so were recommended to try the Rioja instead. A really lovely crisp white, and not too badly priced at £19.50. A buzzy local restaurant with very good quality produce. Great atmosphere, particularly in the respect that it was a Monday night and the restaurant was fully booked. Some slight improvements could be made in terms of service and a helping hand with the menu to explain what’s recommended. Attentive, but slightly intimidating upon arrival. Guests aren’t ‘shown’ to their table, they’re ‘pointed’ to it from the till and told “your table’s there”. The waiter didn’t make any attempt to take us through the menu or tell us what was recommended. That being said, as the evening went on the waiter spent a little more time with us and became warmer and more approachable. Mains – Between £15-£20 for a huge steak and sides are extra. For starters we ordered the Ox Tongue, which was very nice, and reasonably portioned. The Empanadas which came as two decent sized pastries that tasted gorgeous, but weren’t very nicely presented – just popped on to a paper napkin that had soaked up the fat from the fryer. For mains we ordered the sirloin and the fillet. Both way too large in terms of portion size for me, but my partner was in his element! Really good quality steaks that are sourced from Argentina and cooked to perfection. Sides were extra, but again well portioned so I’d recommend choosing two to share. A really good wine selection, although the £15 bottle of Malbec was sold out and so we had to opt for the slightly more expensive La Linda Malbec at £22.50 – worth every penny. A great restaurant that’s perfect for alfresco dining. Mortimer’s Grill is owned by the same people as Black and Blue in Borough Market, and has the same great food but a very different atmosphere. Black and Blue is more of a restaurant destination, where as because of the huge outdoor space at Mortimer’s Grill, it’s got a nice relaxed, almost Ibiza chill out bar feel to it (minus the beach of course!). A mix of people who are just there for drinks and others enjoying good food. Deeeelicious. I had the ‘Foie Gras With Mango, Smoked Chilli Jelly & Toasted Brioches’ to start. It was close your eyes, melt in the mouth gorgeous. My partner had big juicy scallops with black pudding which were really well cooked and very fresh. For main I had the 200g fillet steak (rare of course) and it was so tender – no need for the scarily large steak knife that was provided! Unfortunately the only disappointment of the whole evening was my partners garlic and herb spit-roast chicken. A little on the dry side and with a slight chicken-tikka tang to it (that said, he still managed to finish it!). For dessert I had the cheese board and immediate food envy when the warm apple tart with cinnamon ice cream arrived. A really nice wine selection. We asked the waitress to recommended a white that would go with our menu and she chose a White Cotes du Rhone at a reasonable £17, which was beautifully chilled and perfect. This is a really great restaurant based in-between Soho and Carnaby St. Ideal for a special but informal lunch. Friendly, attentive and genuinely nice, not over the top happy! Although prices are a little on the higher side for a lunch, the portions are absolutely massive and a main is more than enough so the overall meal doesn’t work out too expensive. Really well put together, fresh good quality seasonal produce and imaginative dishes. Good selection for veggies too. Massive portions and you HAVE to order some of their olives. They taste as though they’ve been soaked in a sweet balsamic vinegar and oregano – deeeelicious! A nice selection of wines available and all served at the right temperatures and in nice wine glasses! A lovely restaurant with a great atmosphere. Based in the heart of Borough Market and with large cow outside you can’t miss this restaurant. This is a really lovely small restaurant, situated overlooking the common and great for a sunny day with friends! Really well presented and nice sized portions. The three course Sunday lunch is just enough to cure a hangover and leave you feeling suitably satisfied. The desserts are to die for – strawberry panacotta was my favourite but the white chocolate cheese cake looked good too! Good selection for veggies too. We wanted to go to Roast because we’d seen the chef on Saturday Kitchen quite a few times and liked the idea of his seasonal menu and the fact that it was in such a nice location (in the centre of Borough Market, and with views of the top of St Pauls). Attentive (perhaps a little too much!) and not overly warm or friendly. It felt at points as though the staff had a job to do and we were getting in their way. Well presented, seasonal and using great quality produce. Starters however seemed very expensive for what they were (fish cakes were great but you were given one small one and it cost around £17!). For the main course we shared a hog shoulder (lamb) that was packed with flavour and super tender – you have to order 24 hours before you dine for this. We had side orders of roast potatoes in beef dripping (delicious) and mixed greens and creamed corn. Dessert was very disappointing – described as an apple and cider trifle, the apple was raw and cold, and the whole thing a little watery rather rich and sumptuous with a cider kick that you’d have expected. A great selection of wines, although quite pricey. We had the red from Chapel Down, a lovely vineyard that we’ve visited before in Rye. After endless rave reviews and seeing Gordon Ramsay portraying himself as the perfectionist of the cooking world, we couldn’t wait to visit Claridges. Unfortunately the reality isn’t as great as the hype. Ramsay always harps on about great waiters being quiet and not heard, however we were interrupted every 10 minutes and cuttlery and plates being clattered about all over the place. The atmosphere had a buzz to it but mainly from the guests in the restaurant. the restaurant decor itself felt like it could do with a lick of paint and a bit of a clean – a shame compared to the breath taking hotel lobby and bar that you enter through. 2 gin and tonics, 2 taster menus, and one bottle of the cheapest wine on the menu = £320 outrageous! Obviously well presented and using great quality produce, however extremely small portions and ridiculously overpriced. We went for the taster menu and when we saw ‘scallop’ as the starter, we really didn’t expect to have A scallop! Left £300 lighter and picked up a KFC on the way home!! A great selection of wines but nothing under the £30 price tag, the bottle that we did have I’m sure I’ve bought in Waitrose for a quarter of the price! Ooo I’d love to try Cinnamon Culture. We had one fine dining Indian restaurant in Liverpool and I miss it. I love your reviews Regan – very balanced and honest. Thanks Jo 🙂 it’s a really nice place and the food is delish. My fav Indian restaurant though has to be Indian Essence – it’s Atul Kocchar’s place and is only a few miles away from where we live in Petts Wood. When I went I was pregnant so am defo going back to have the grilled seafood platter and mojito’s! !